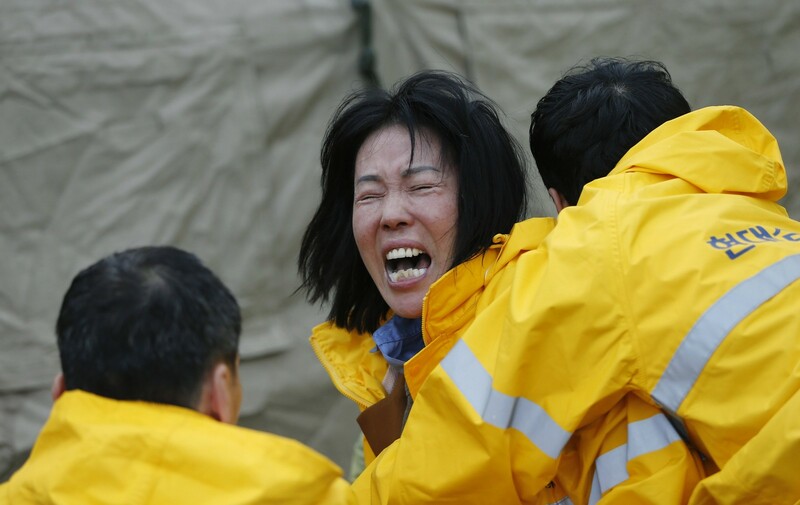 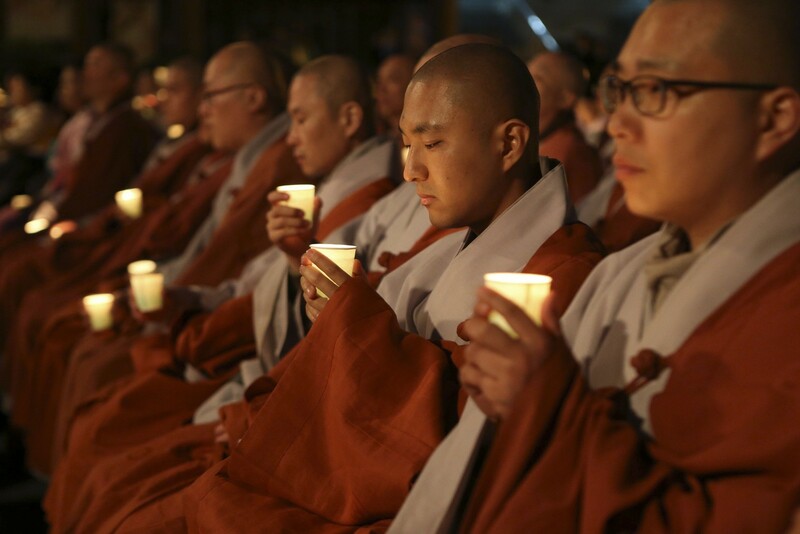 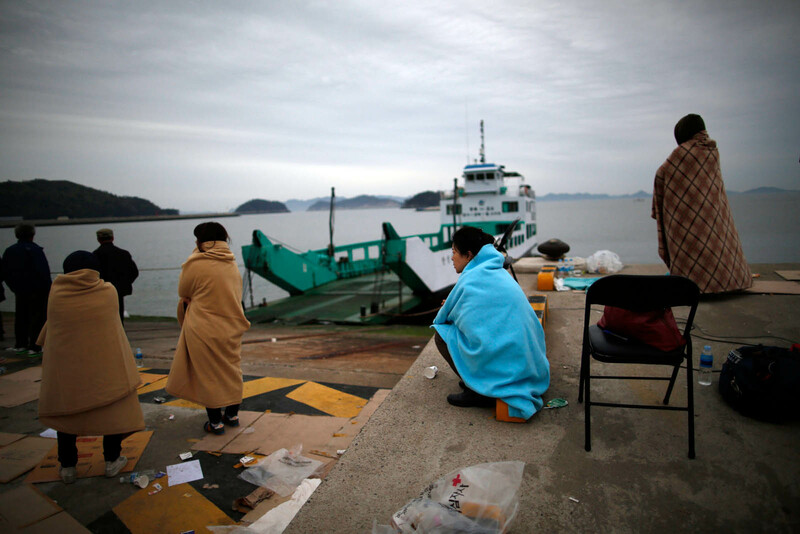 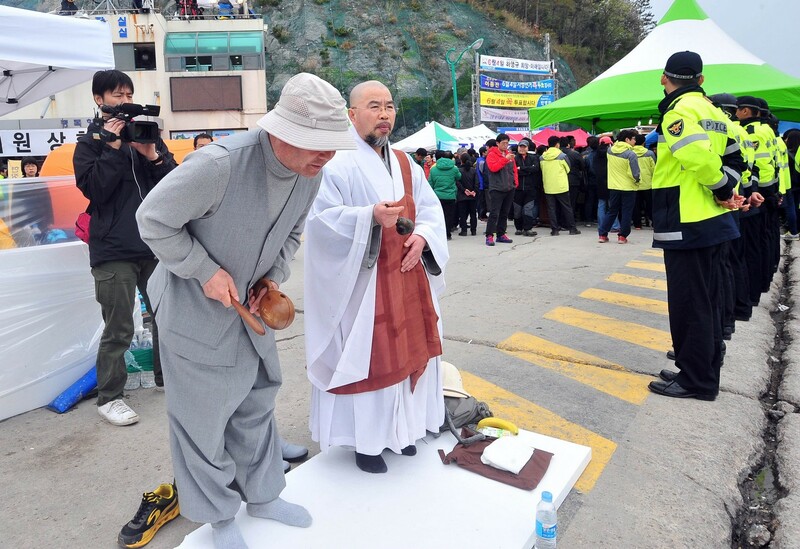 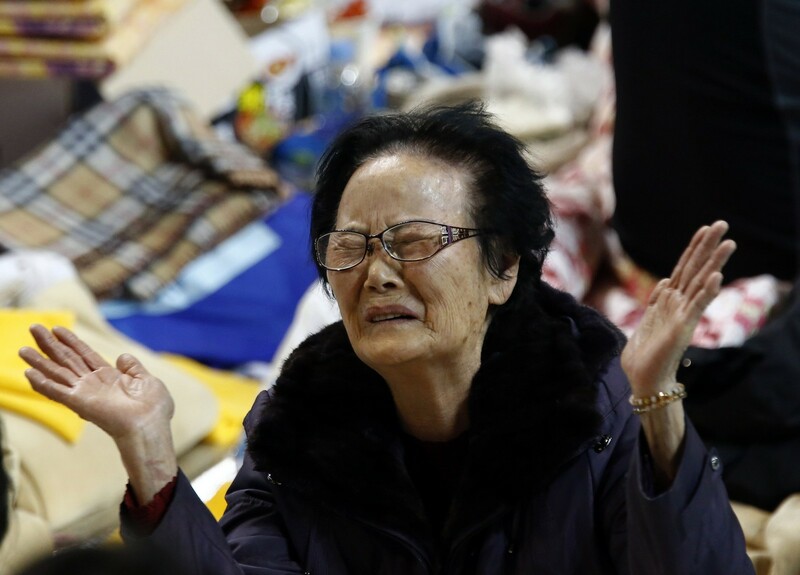 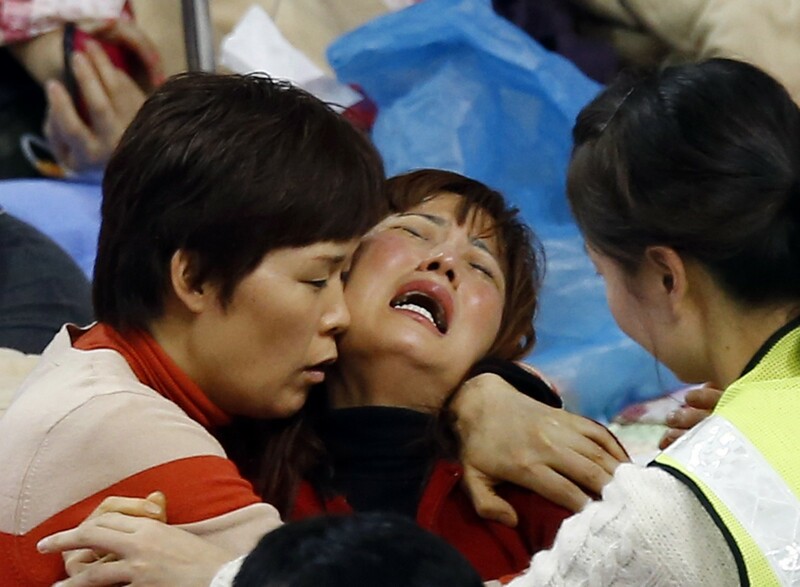 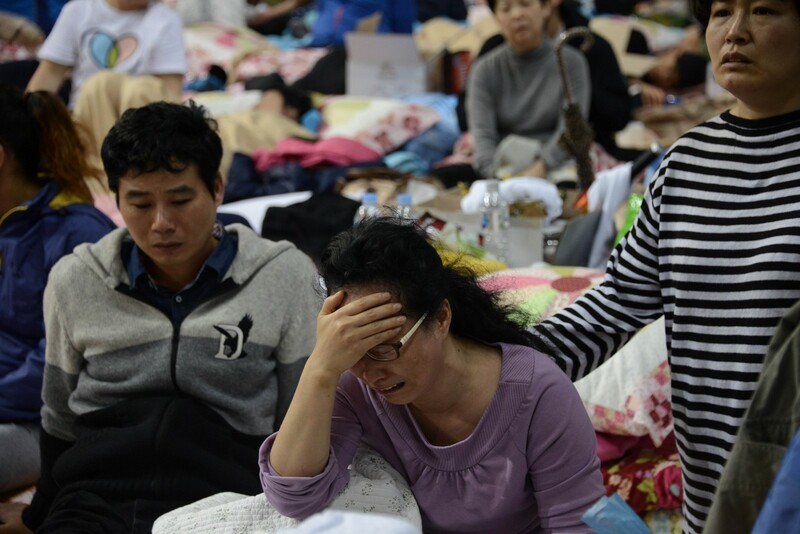 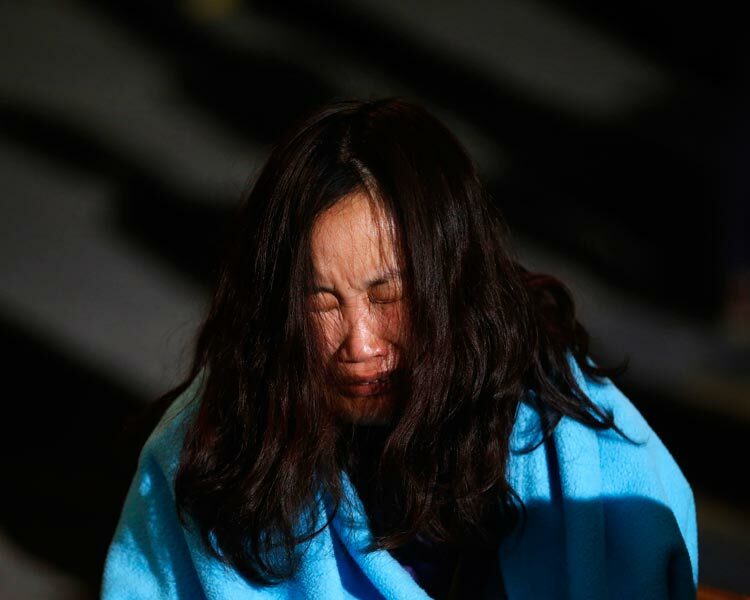 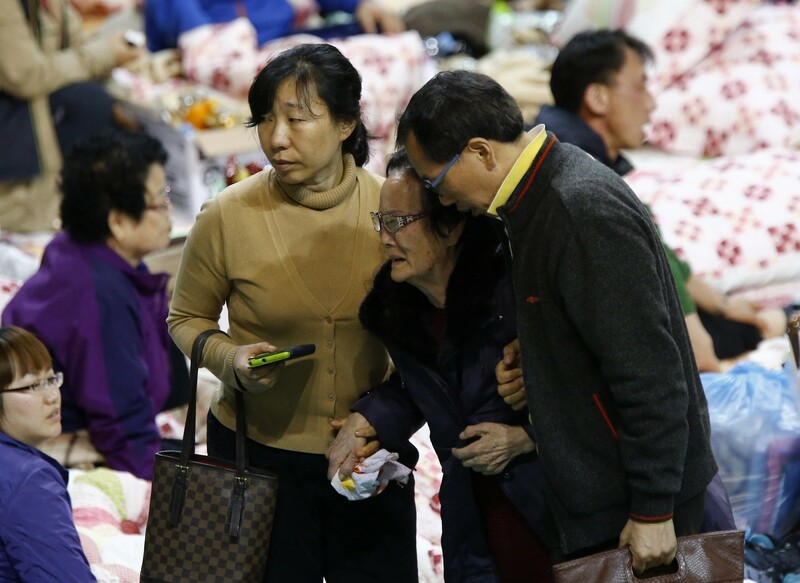 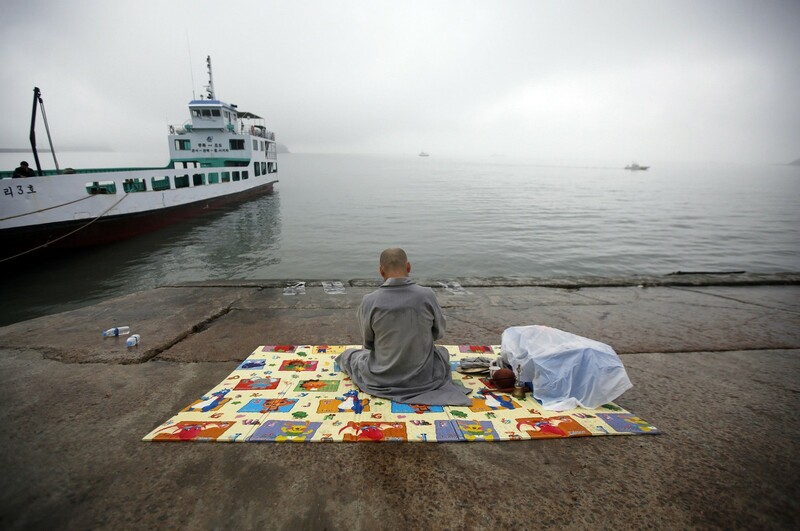 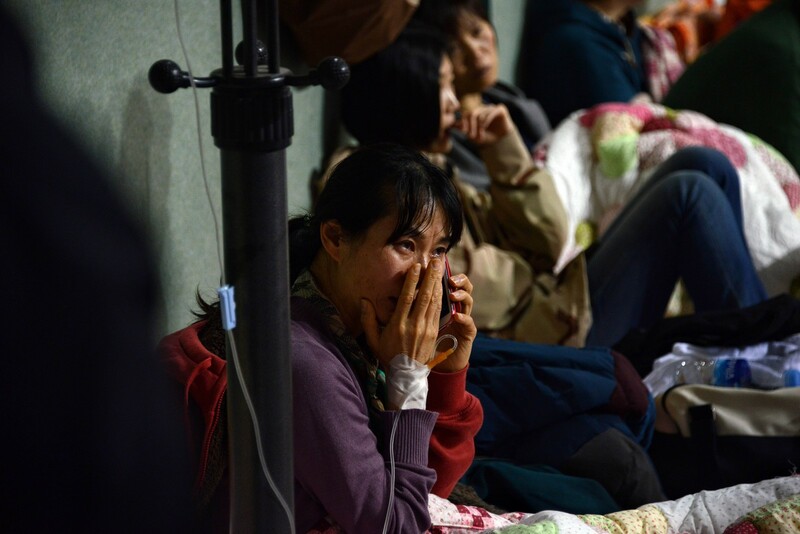 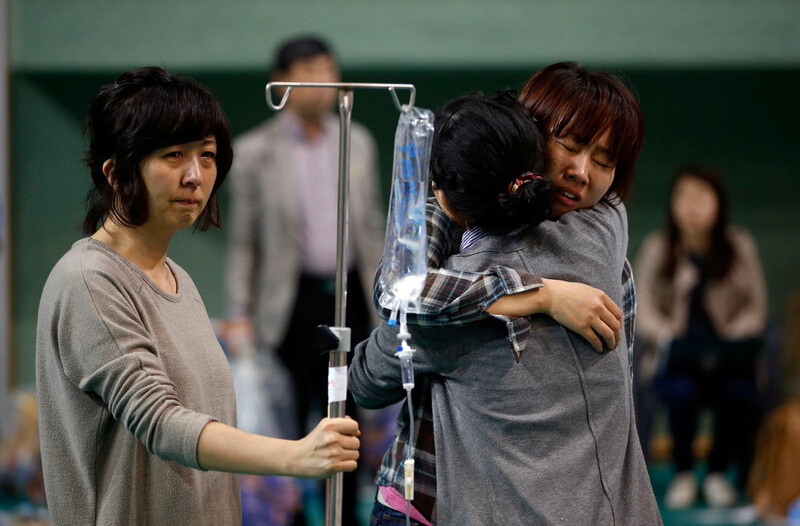 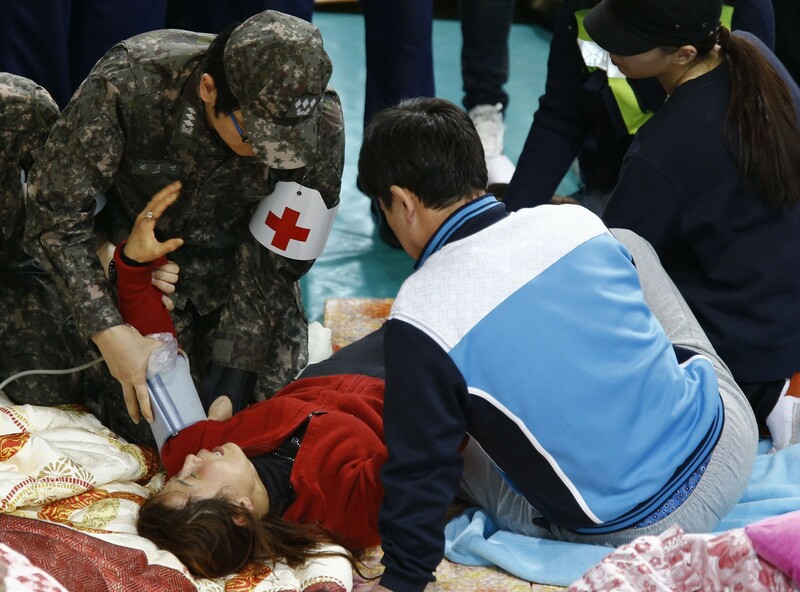 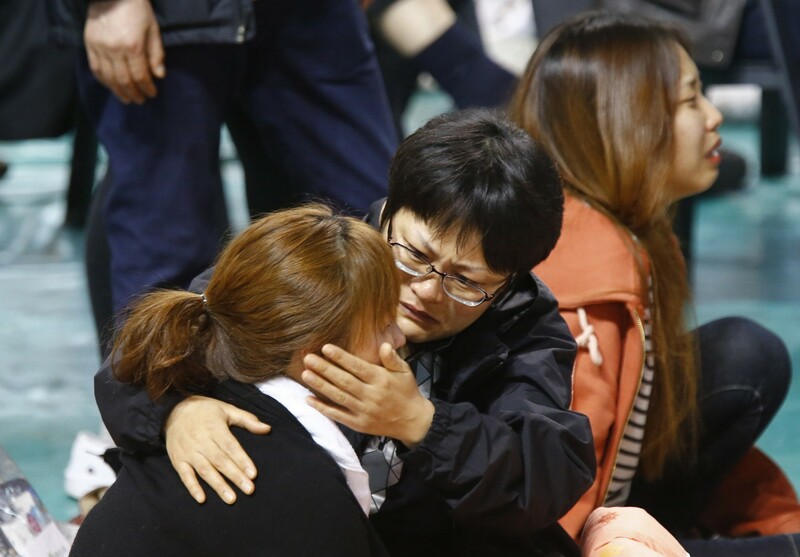 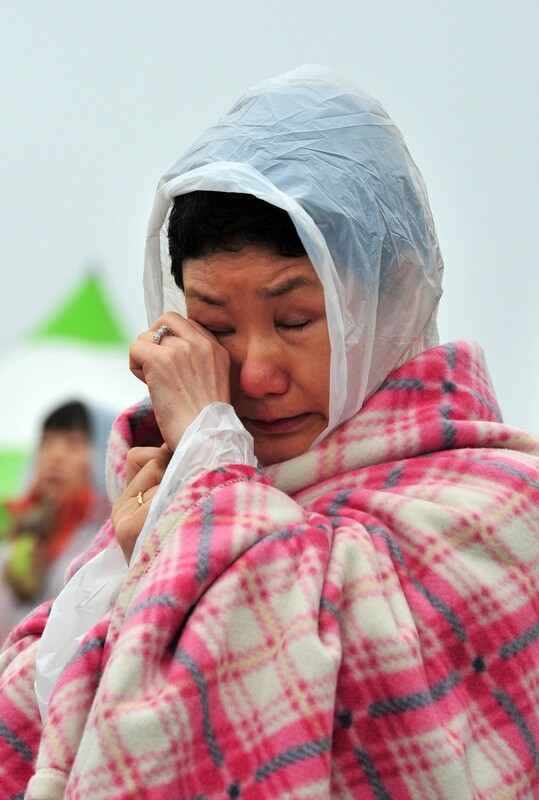 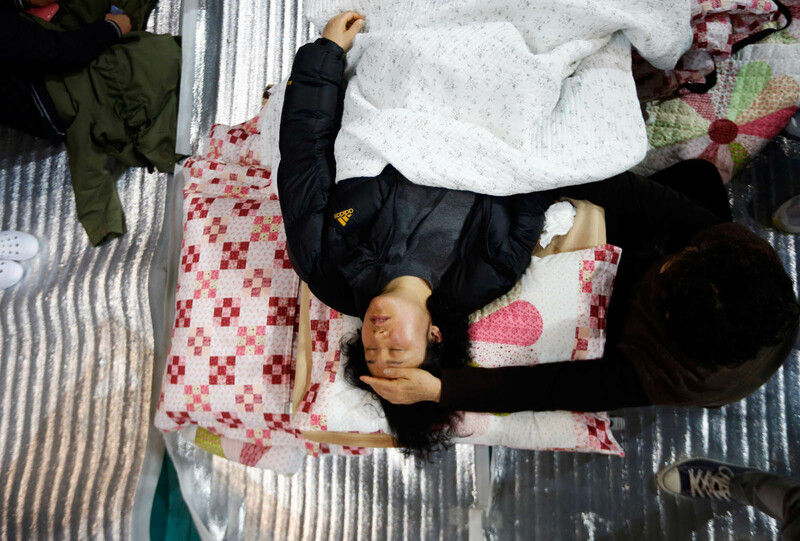 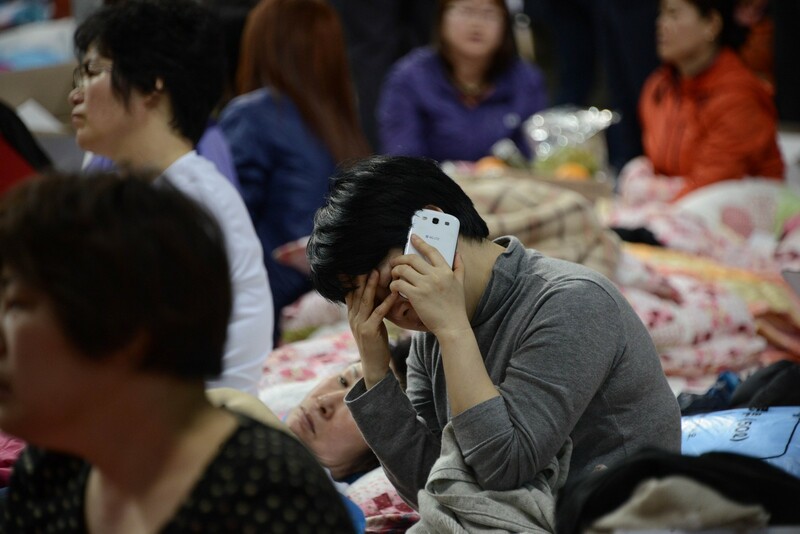 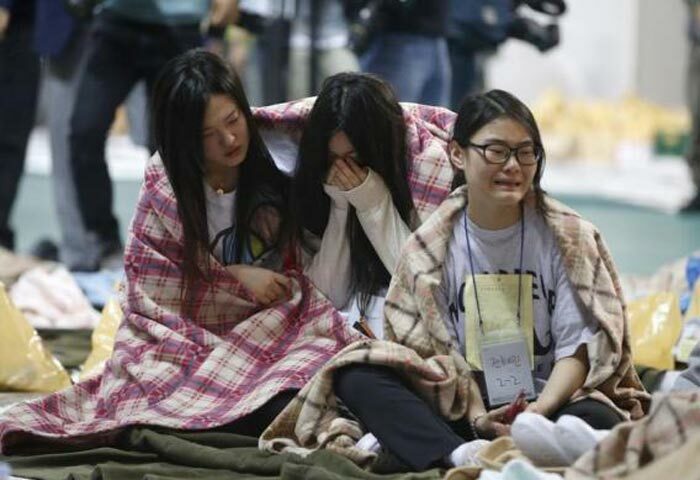 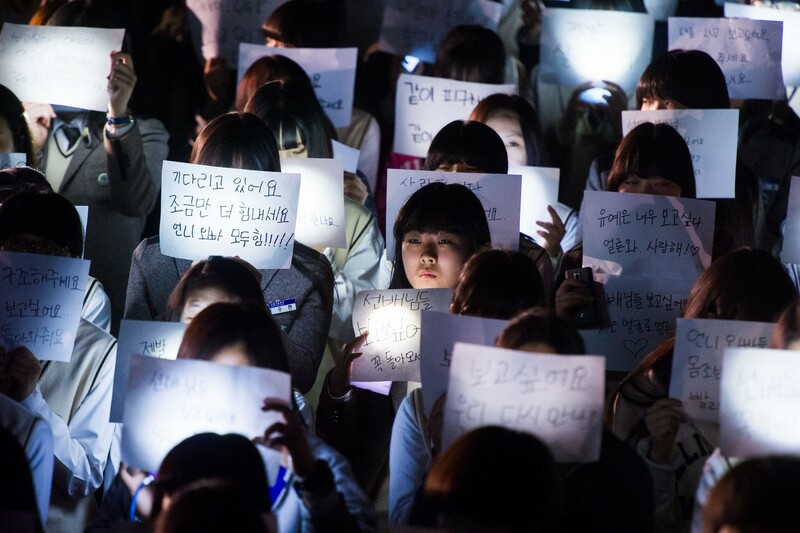 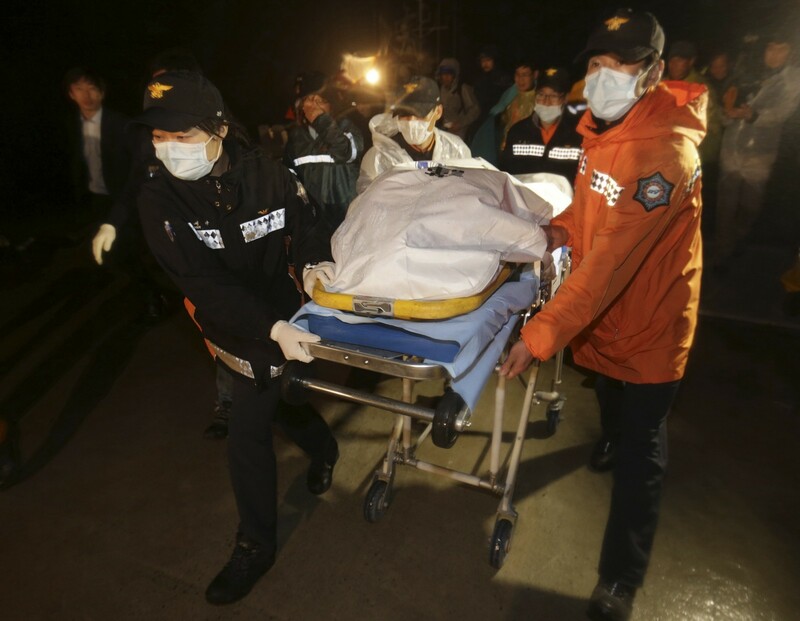 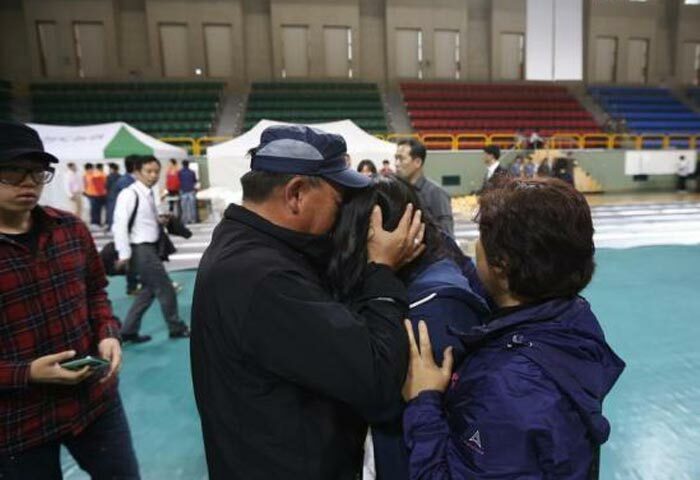 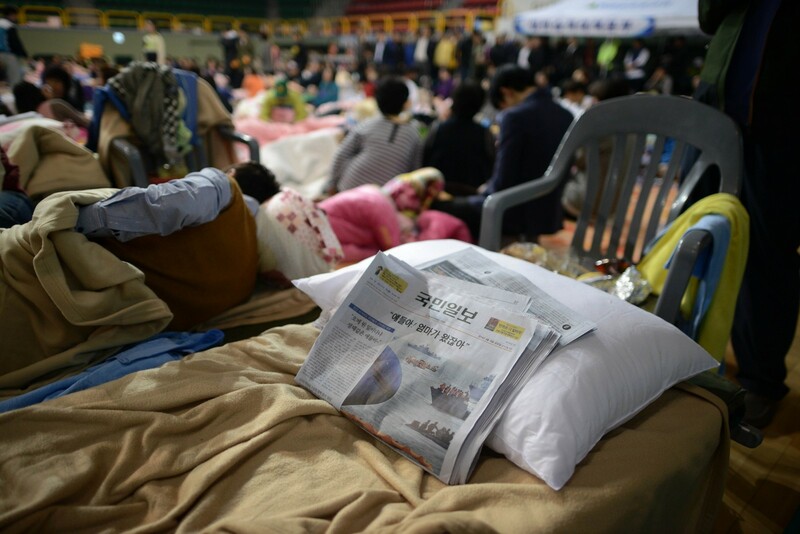 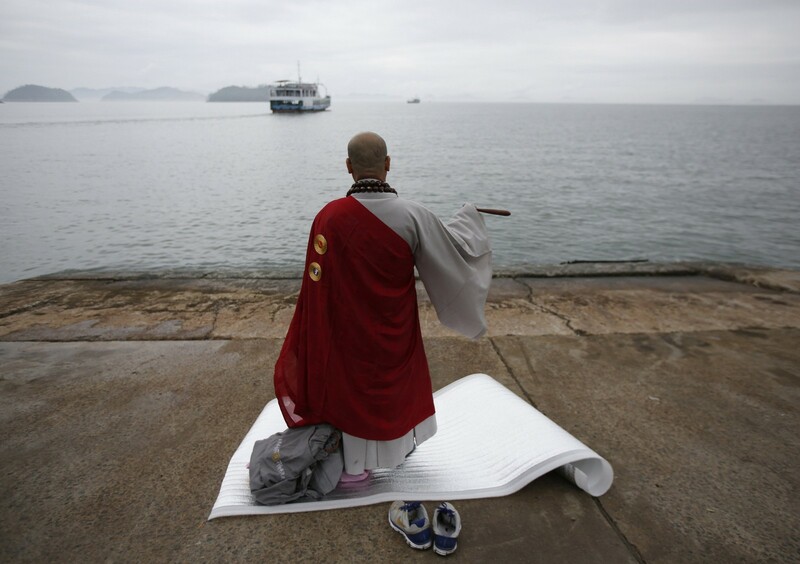 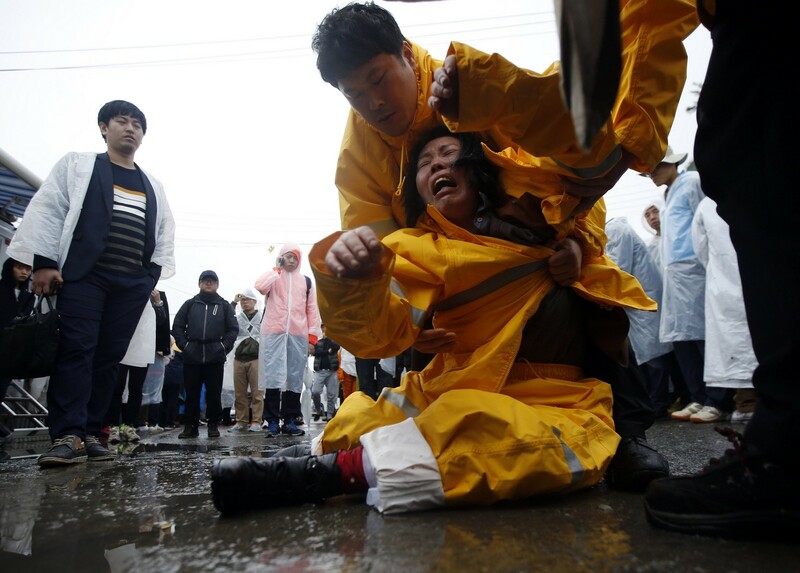 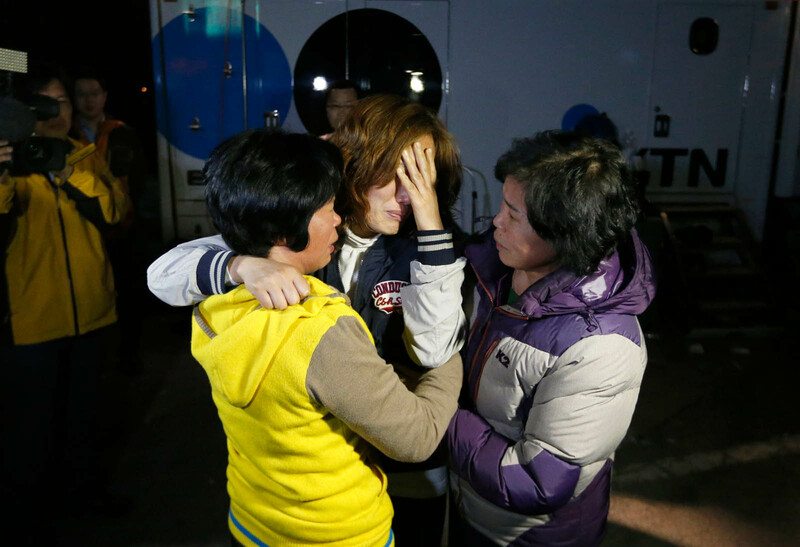 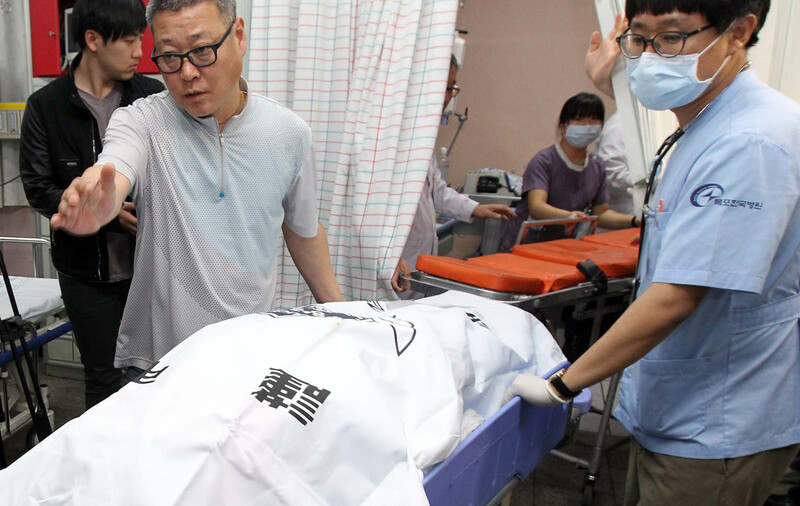 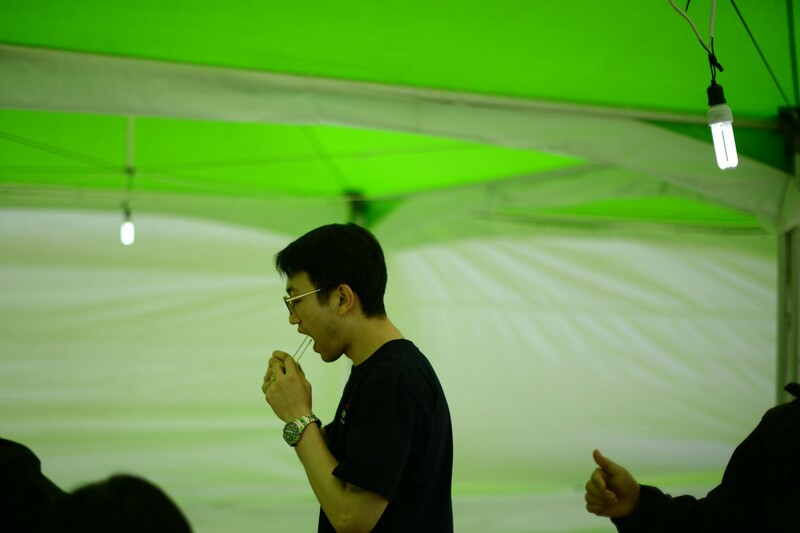 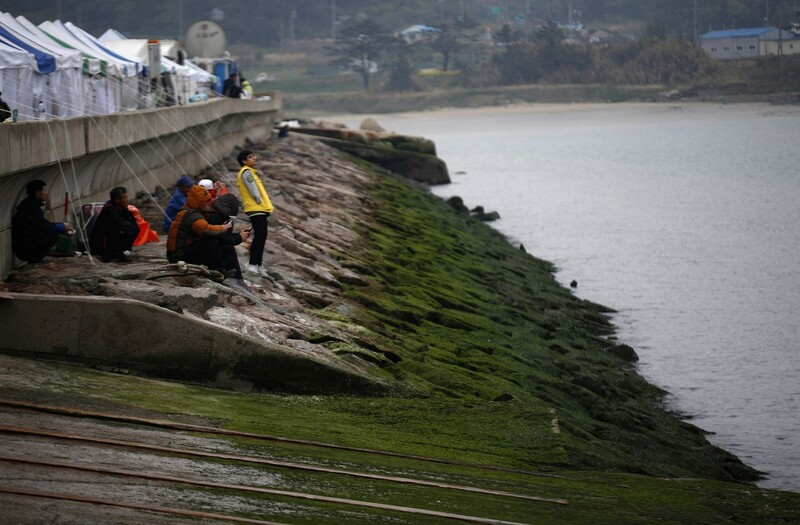 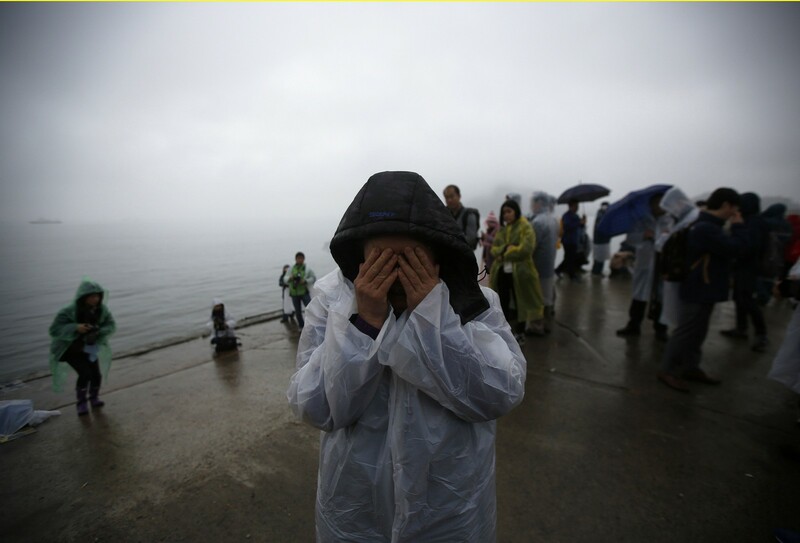 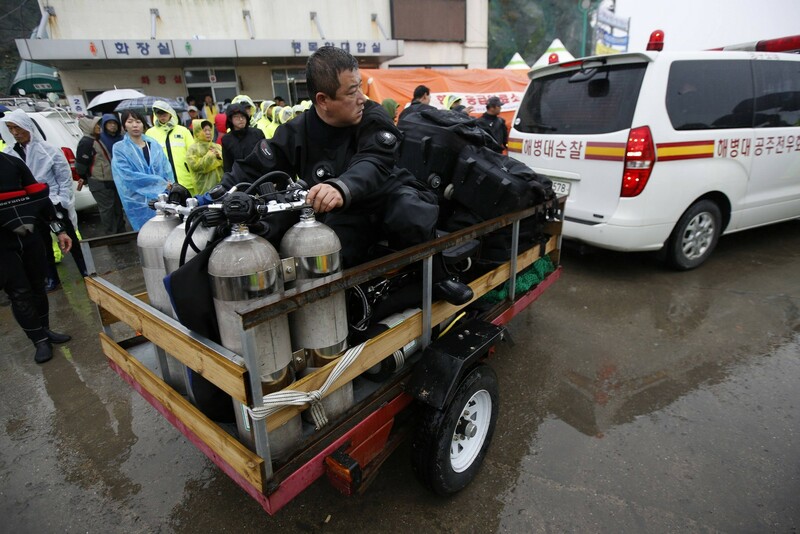 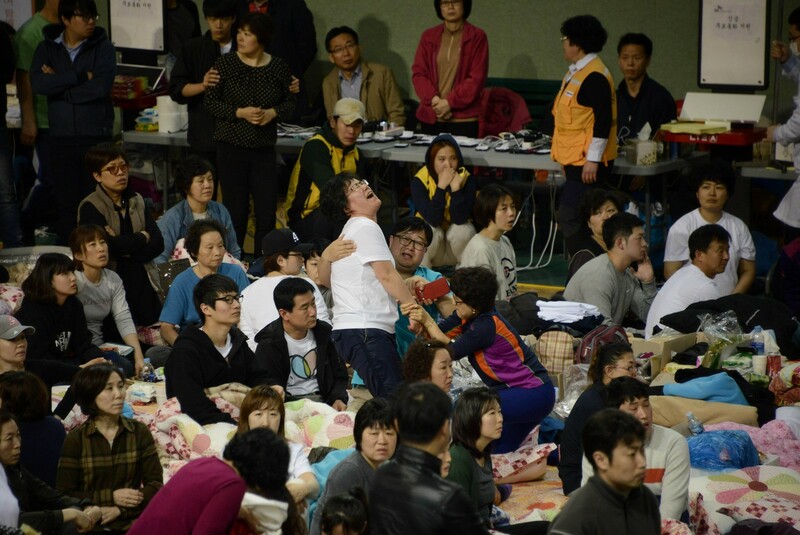 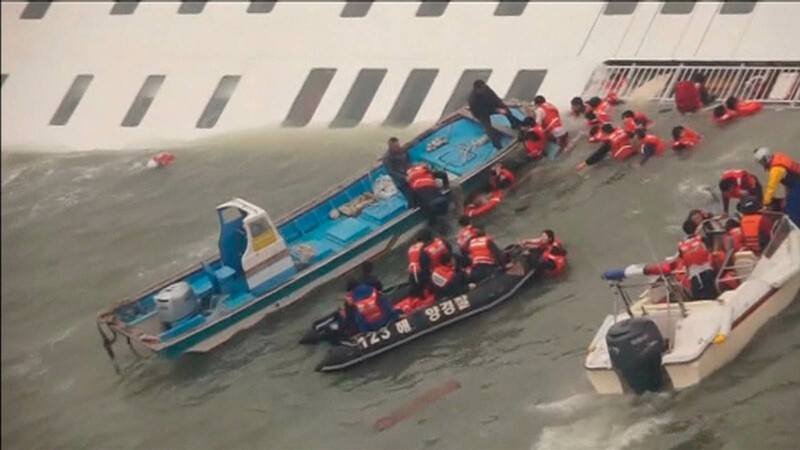 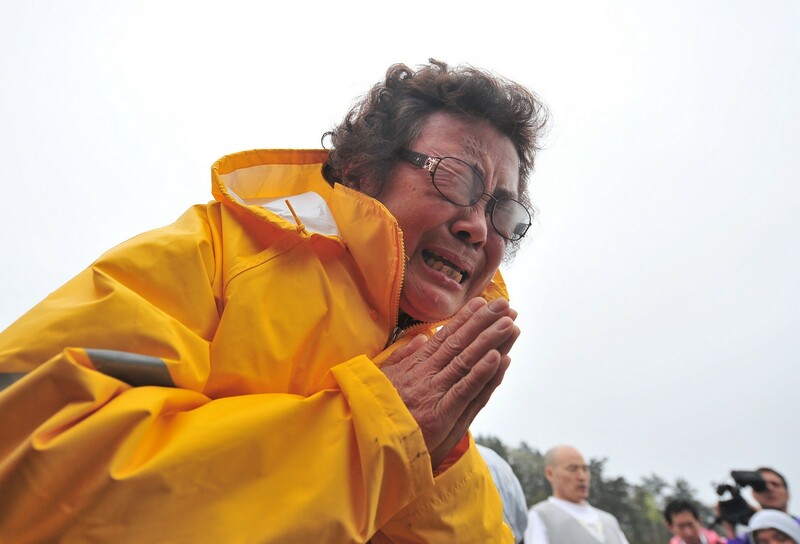 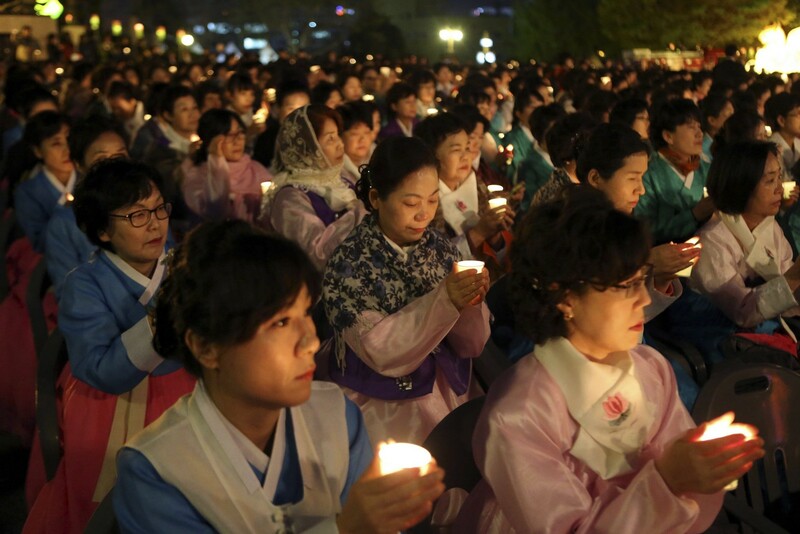 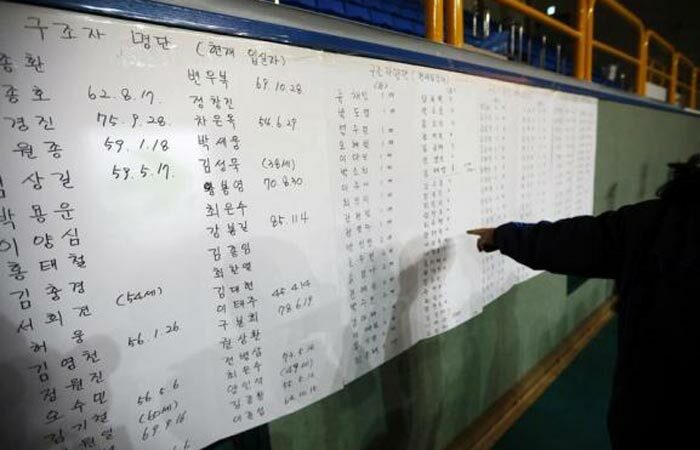 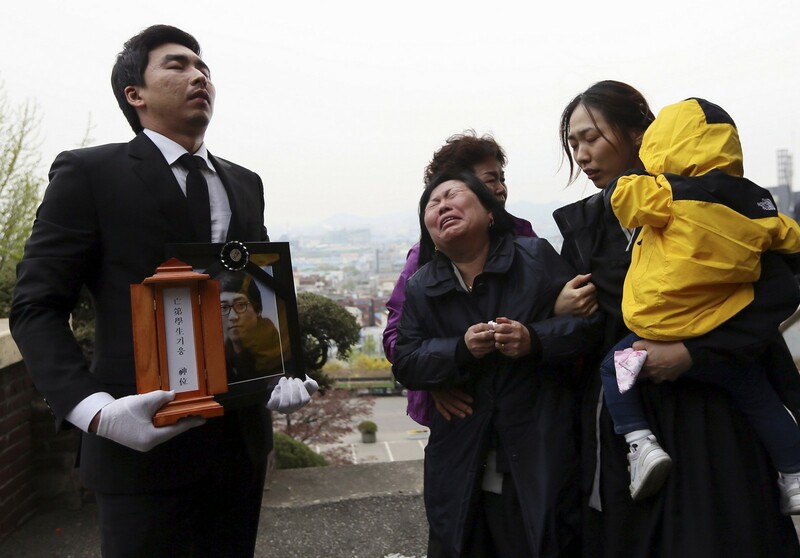 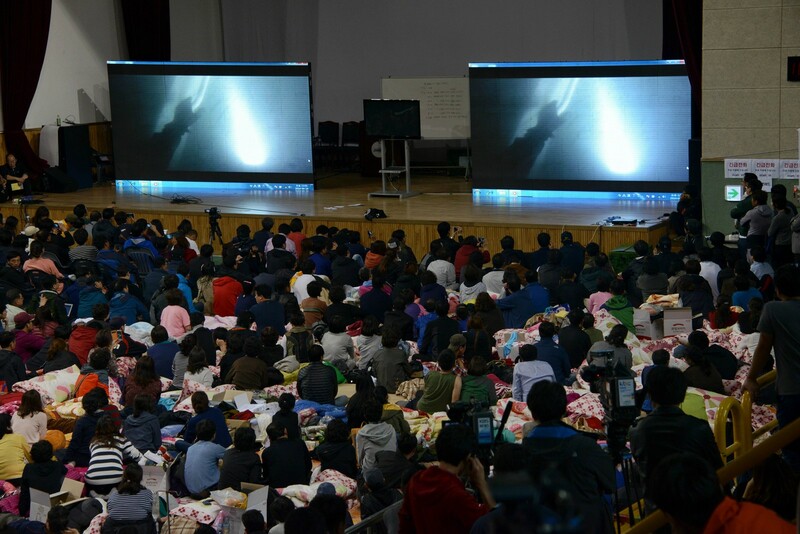 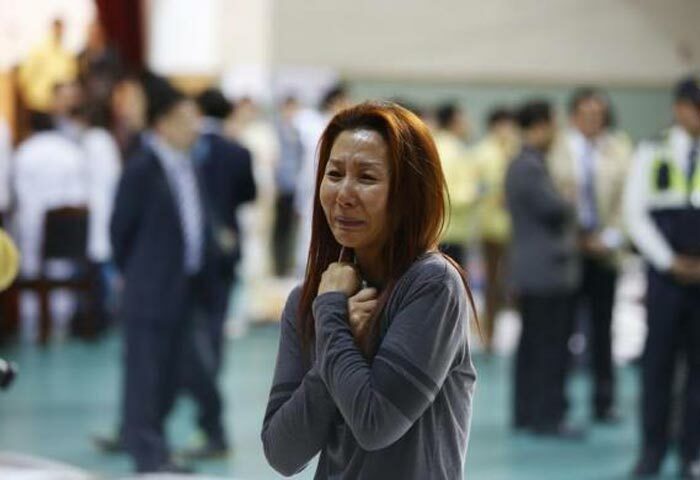 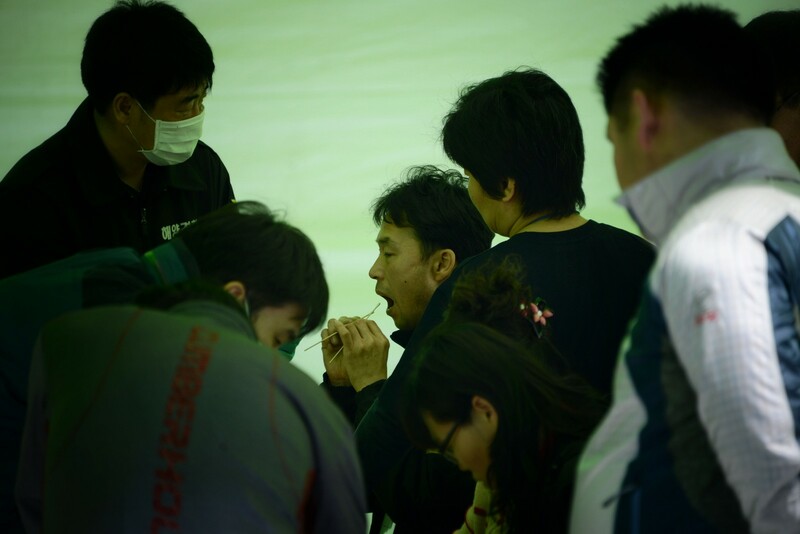 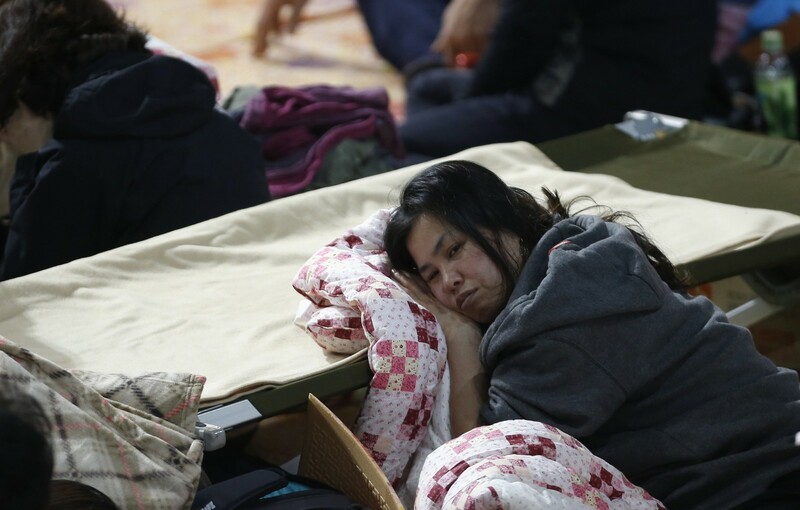 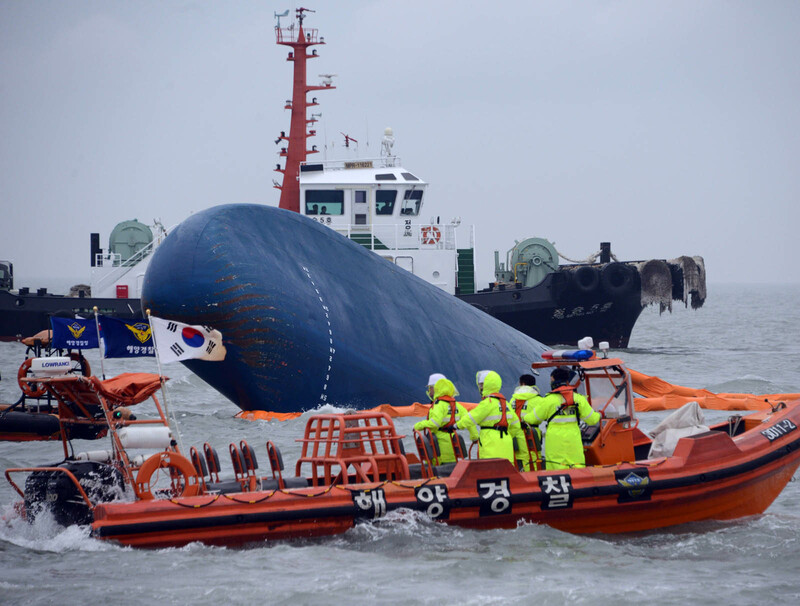 SOUTH KOREA - Most of the surviving crew of the sunken ferry Sewol is to be prosecuted for their part in the accident and failing to implement safety measures during the sinking. 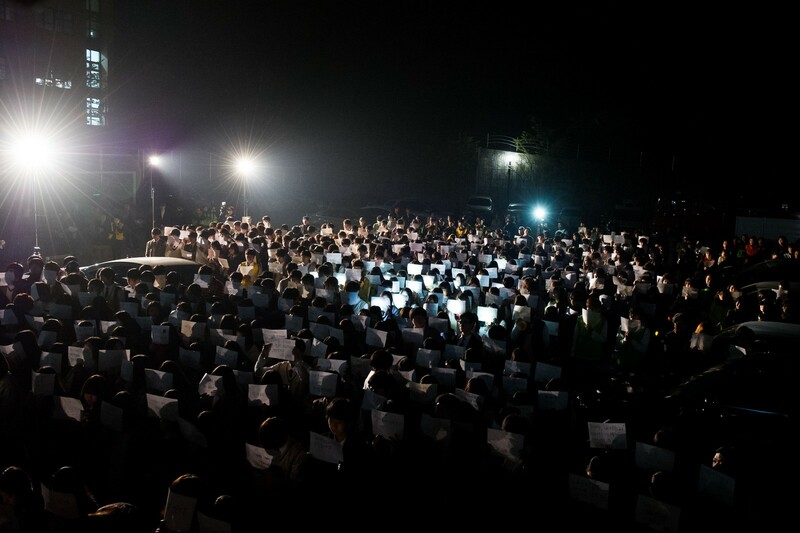 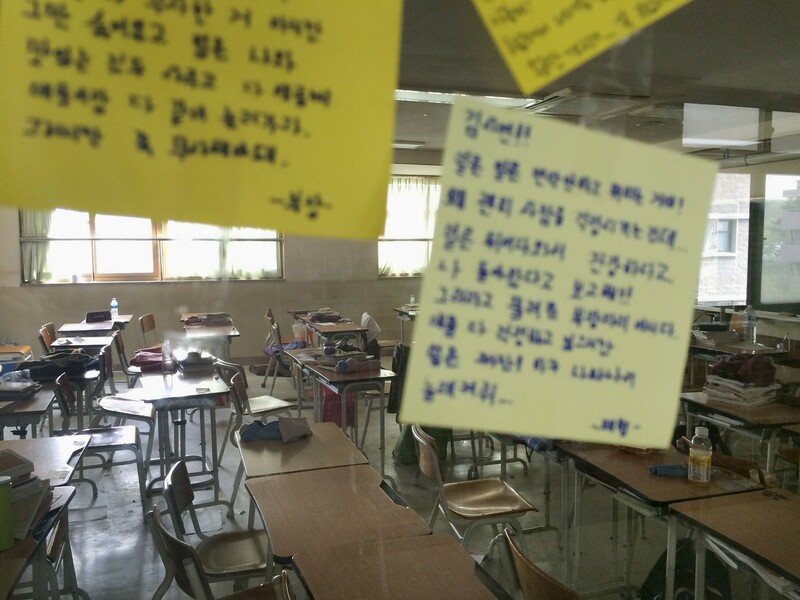 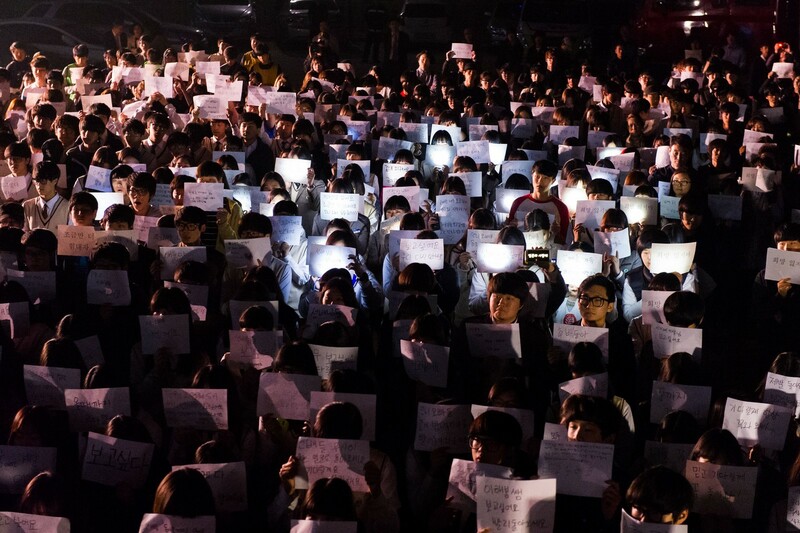 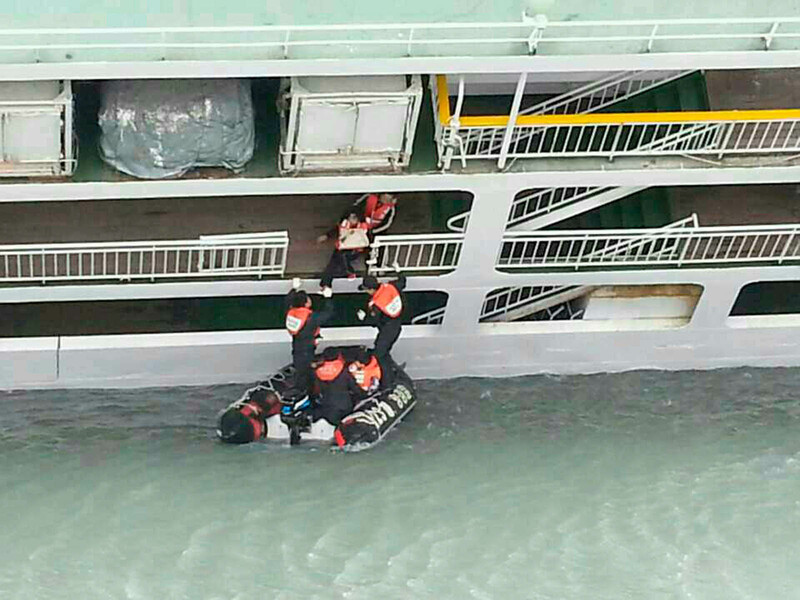 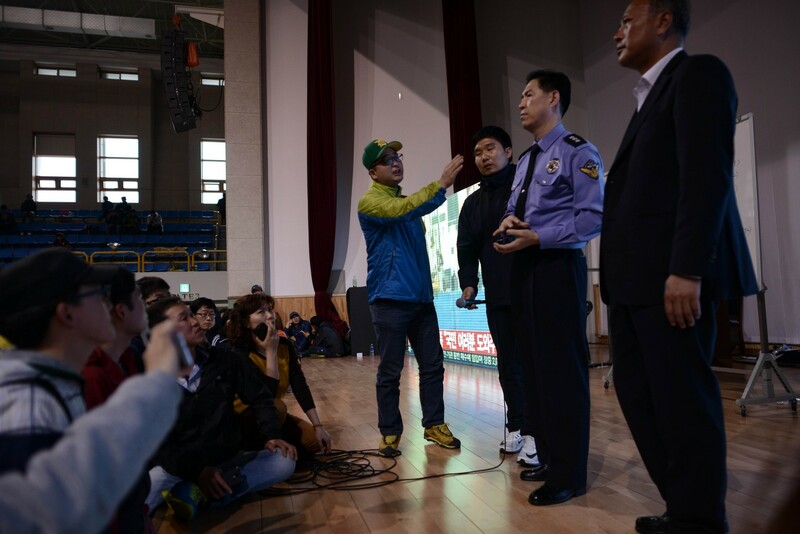 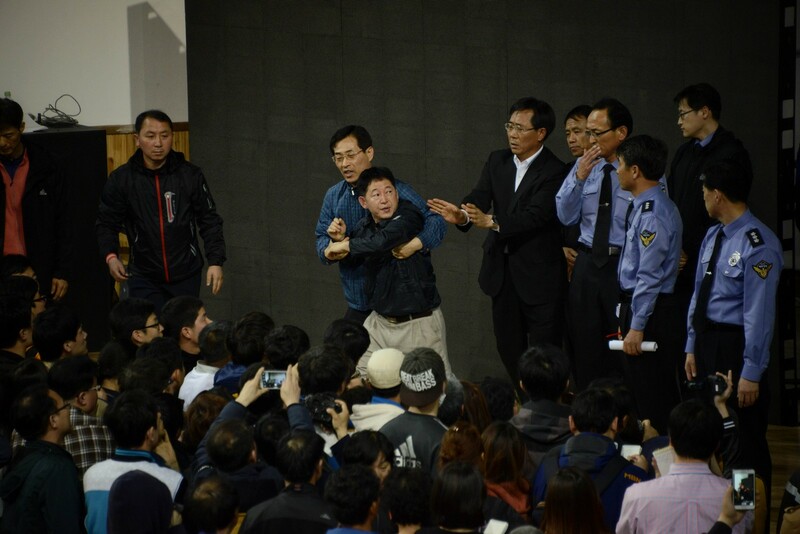 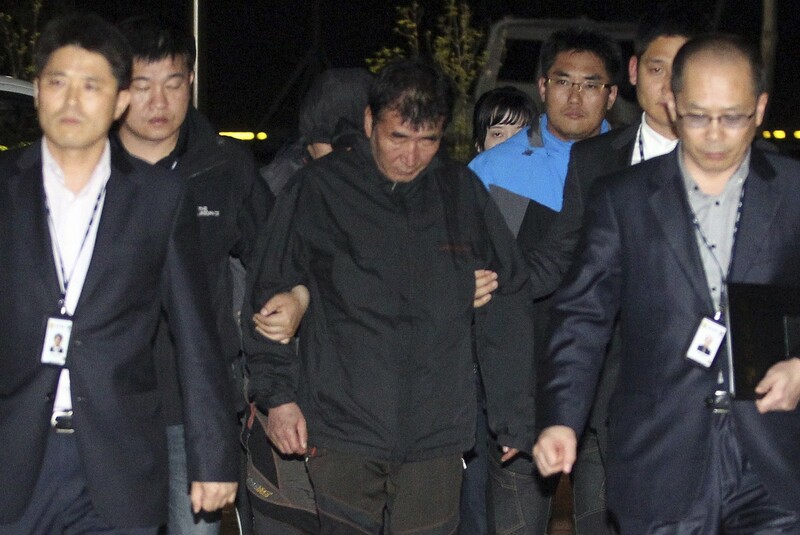 On Wednesday, investigators took three more crew members into custody for failing to implement safety measures for the Sewol's passengers as they escaped the sinking ship. 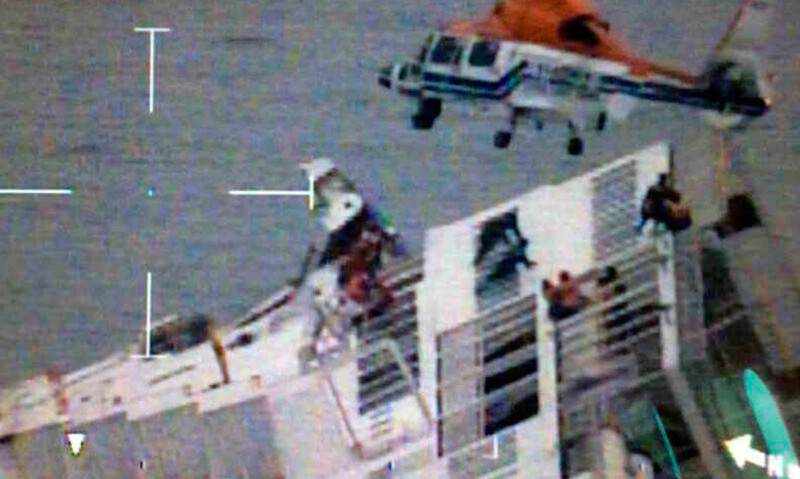 Of the 15 crew members who are directly involved in operating the ship, 11 are now in custody. 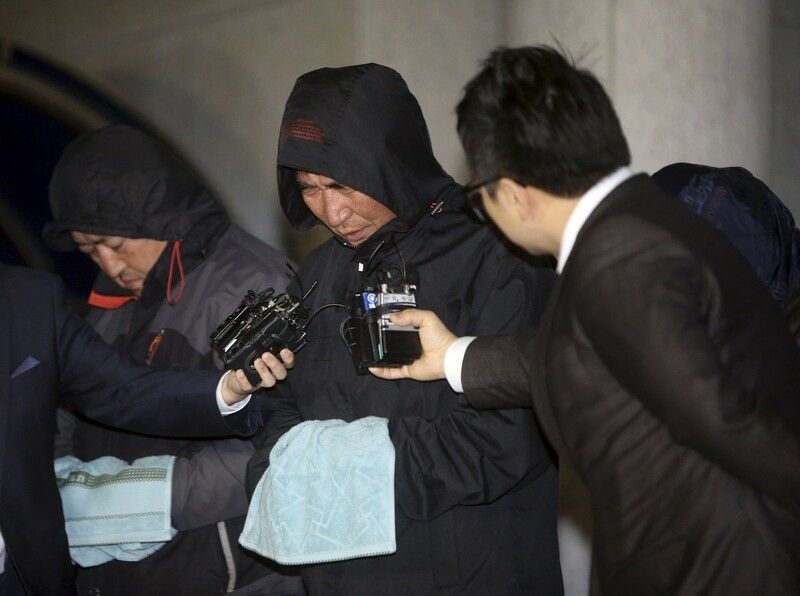 The remaining four are also to be investigated as suspects in the case. 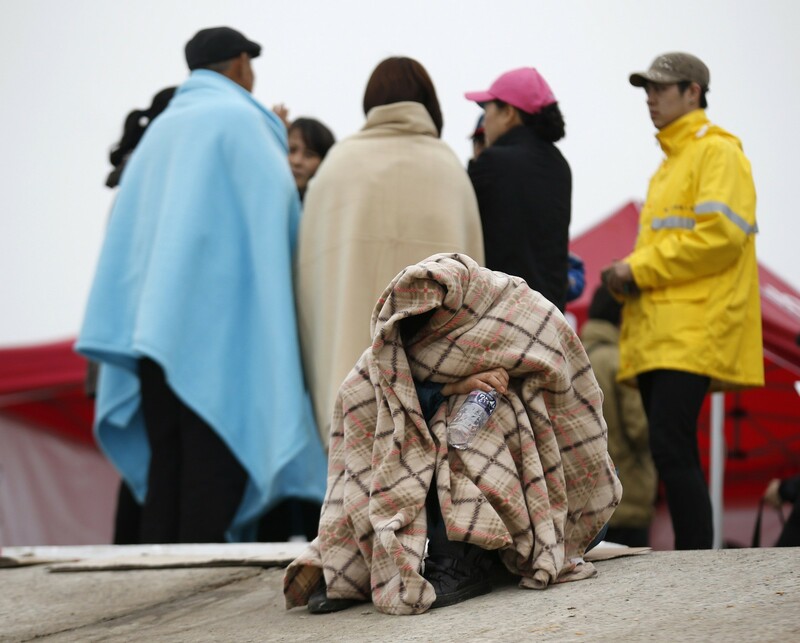 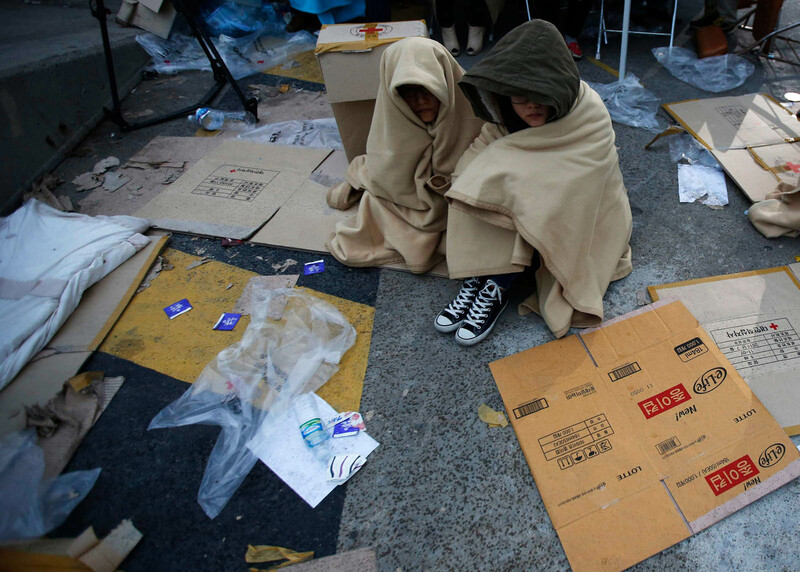 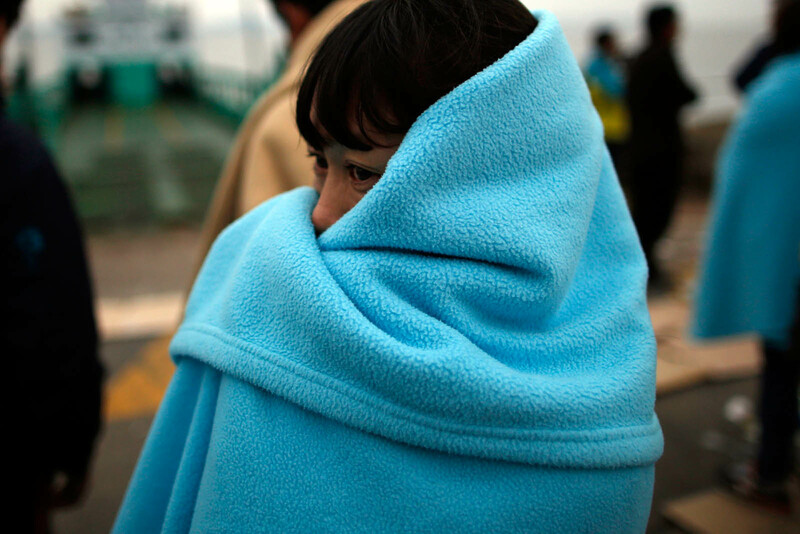 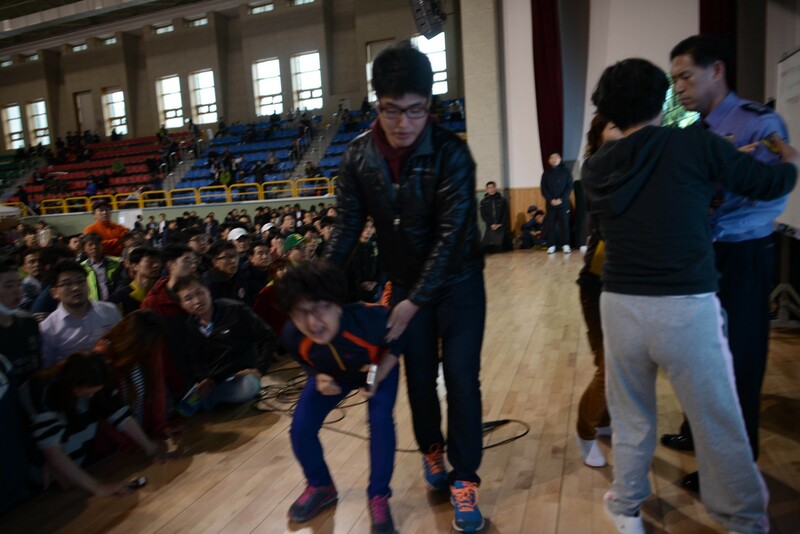 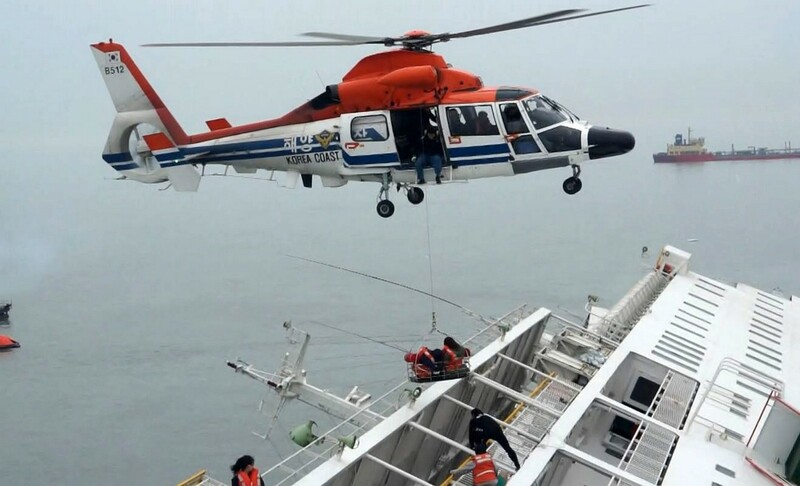 The 15 were among the first to be rescued. 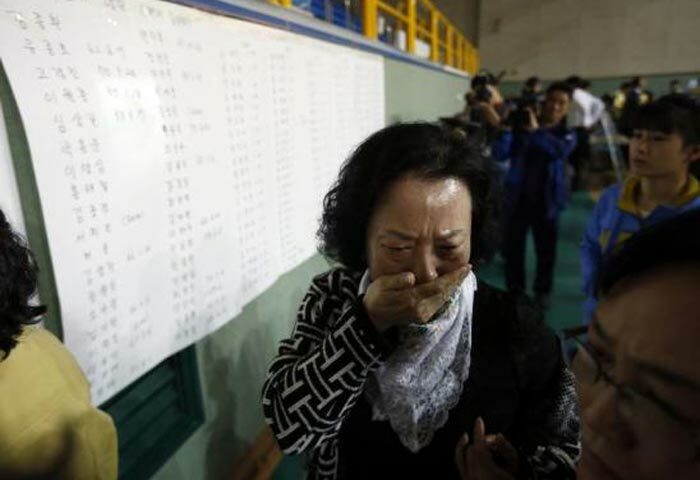 Meanwhile the death toll continued to rise. 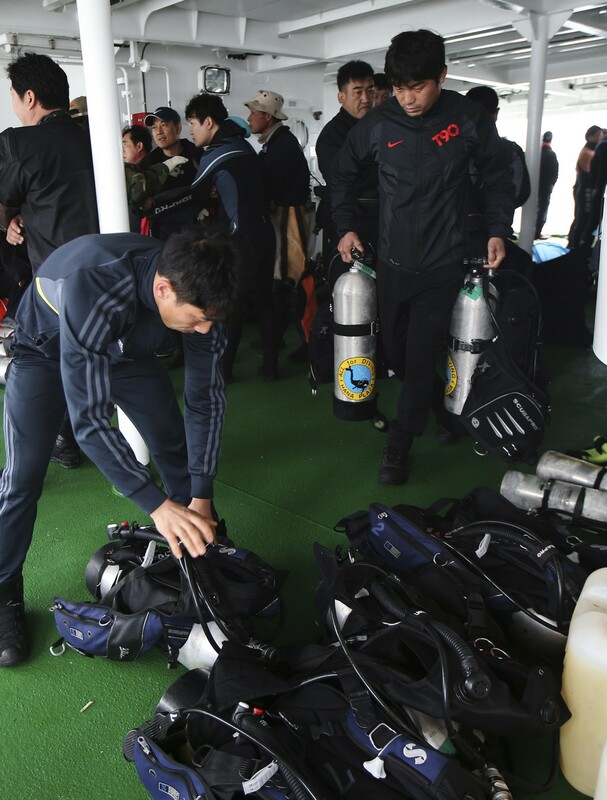 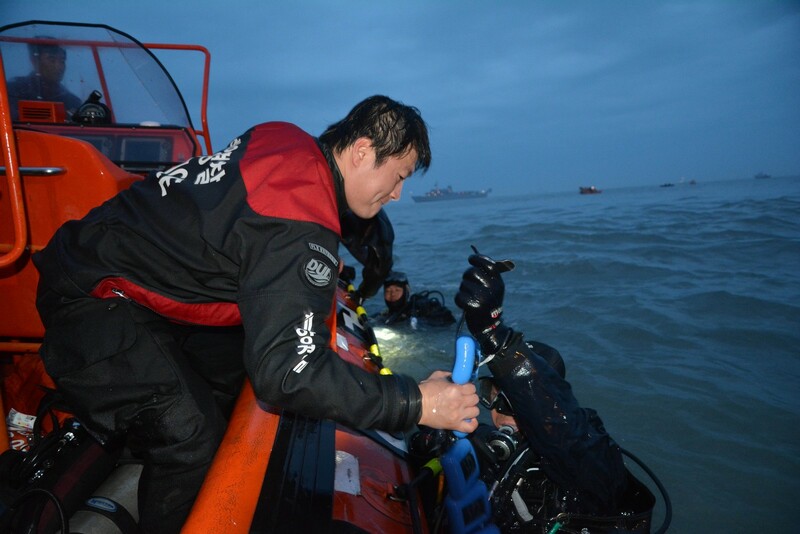 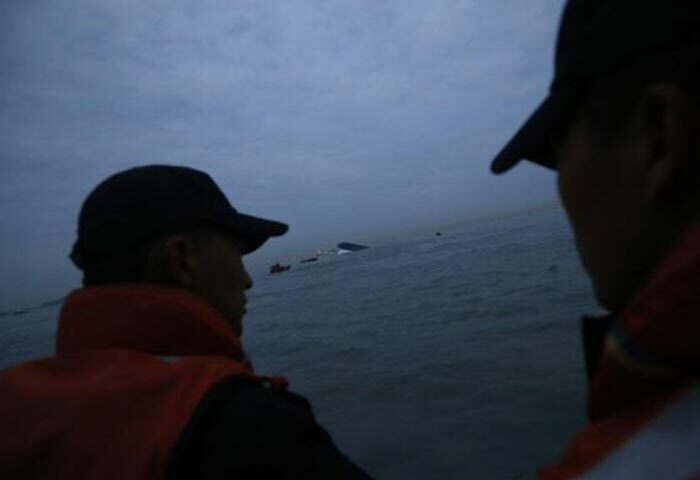 Divers resumed searching inside the vessel early Wednesday and recovered more than 20 bodies before work was halted around midmorning due to rapidly changing currents. 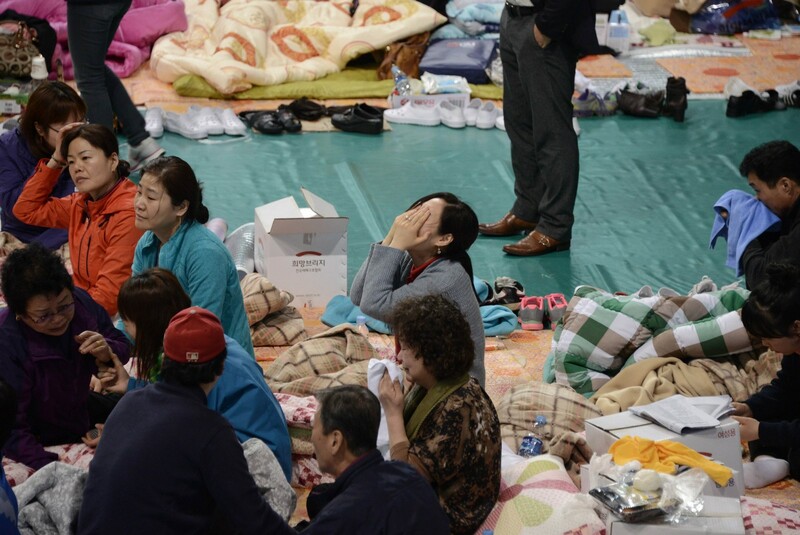 As of 4 p.m. the death toll stood at 150. 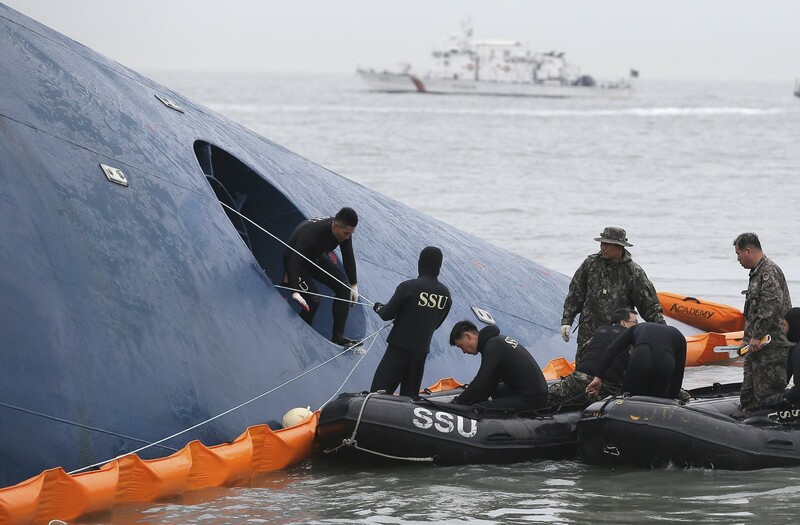 The number of missing stood at 152 as divers were redeployed at about 3:30 p.m.
As the investigation unfolds, more irregularities in the ship's operations and the accounts told by the surviving crew have surfaced. 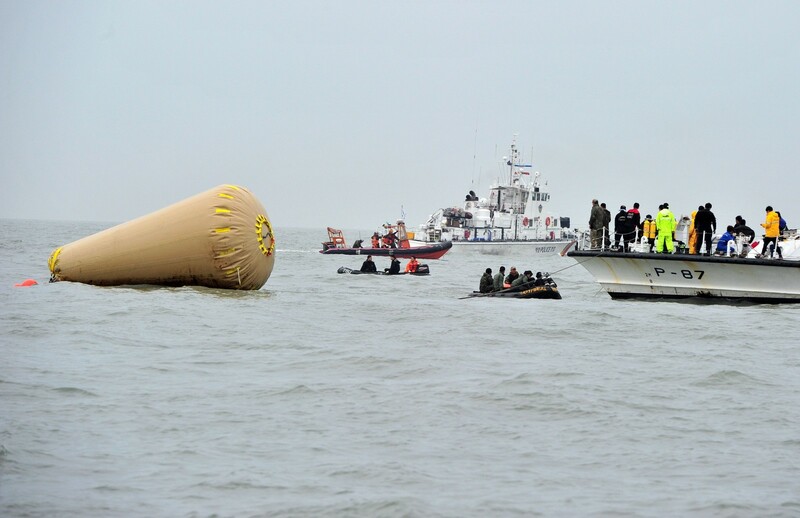 The claim that the situation had deteriorated to the point that crew members were unable to release lifeboats despite attempting to do so appears to have been false. 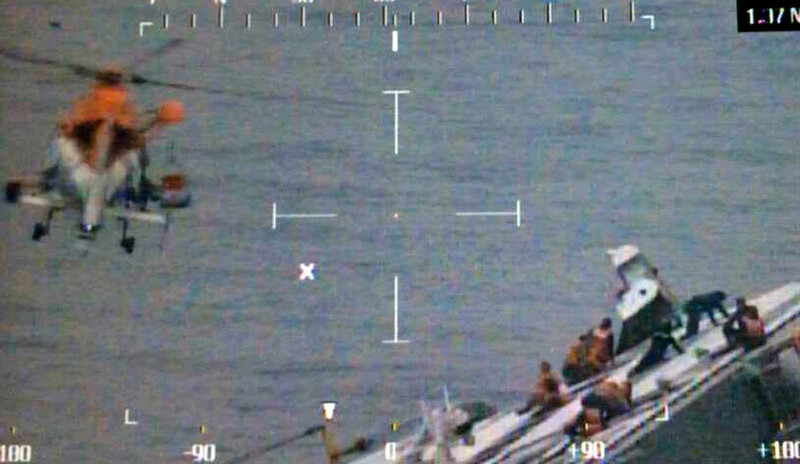 Despite such claims from crew members, photographs taken by the Coast Guard during the initial rescue efforts show a Coast Guard officer releasing two lifeboats into the sea. 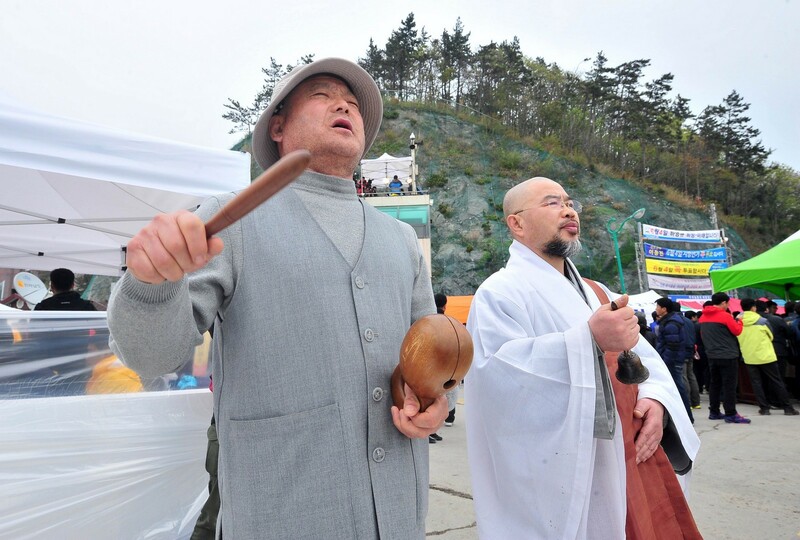 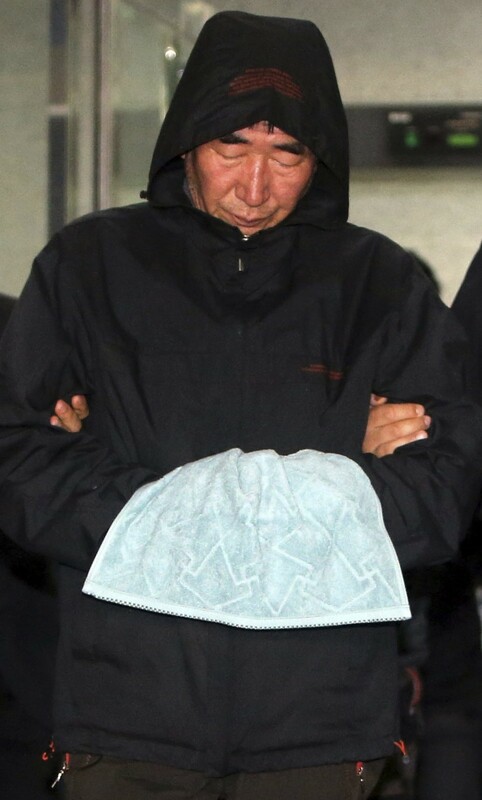 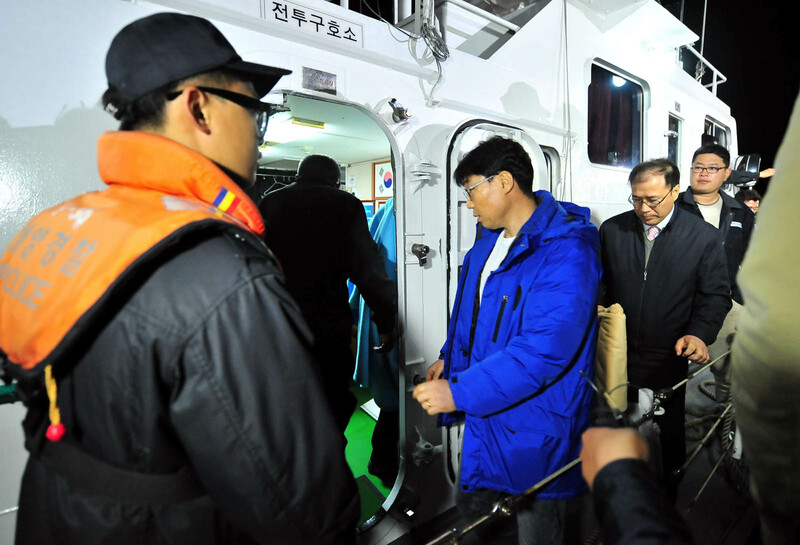 Disproving Sewol's captain Lee Joon-seok's claim that he issued the order to abandon ship, however, has run into difficulties despite contradictory accounts from passengers and some crew members. 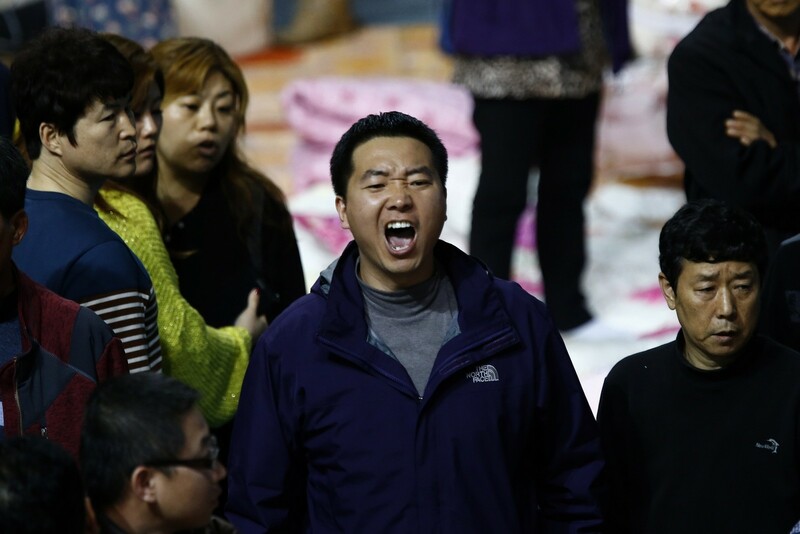 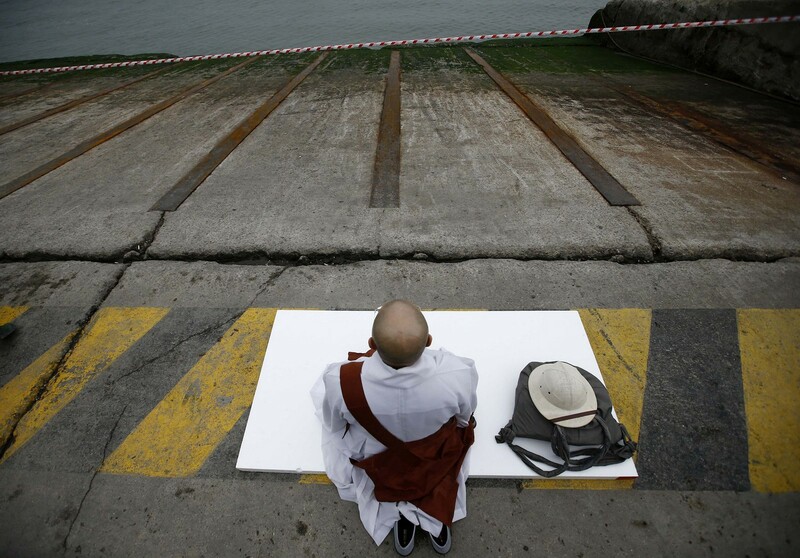 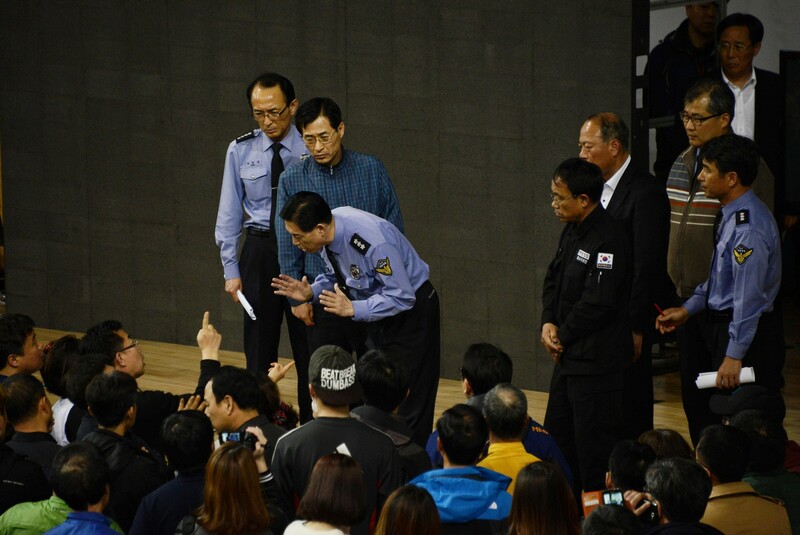 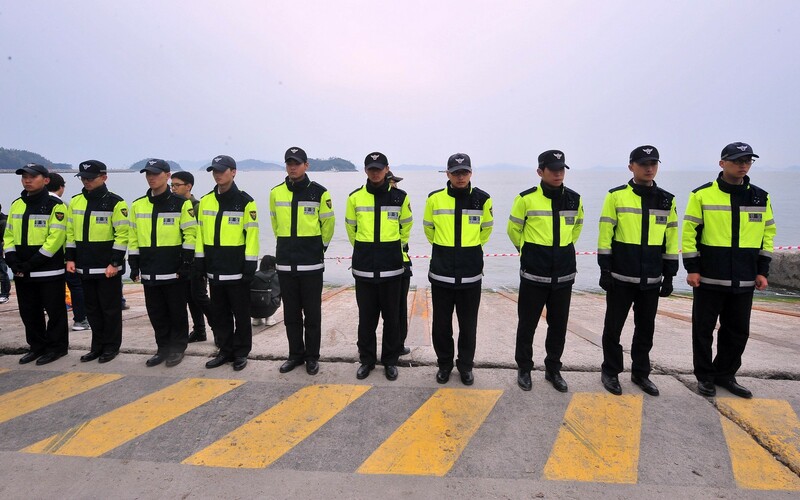 The four crew members arrested on Tuesday told the authorities that Lee did issue the order, directly contradicting rescued passengers' accounts that they were repeatedly told to stay in their cabins. 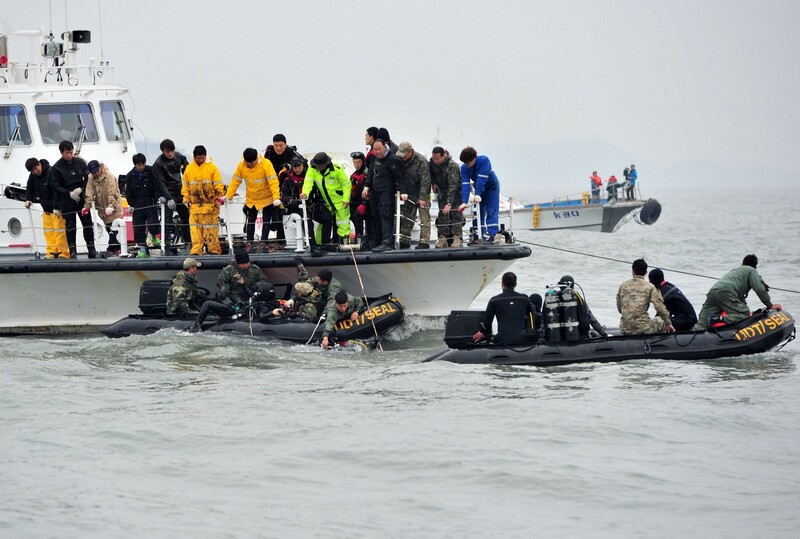 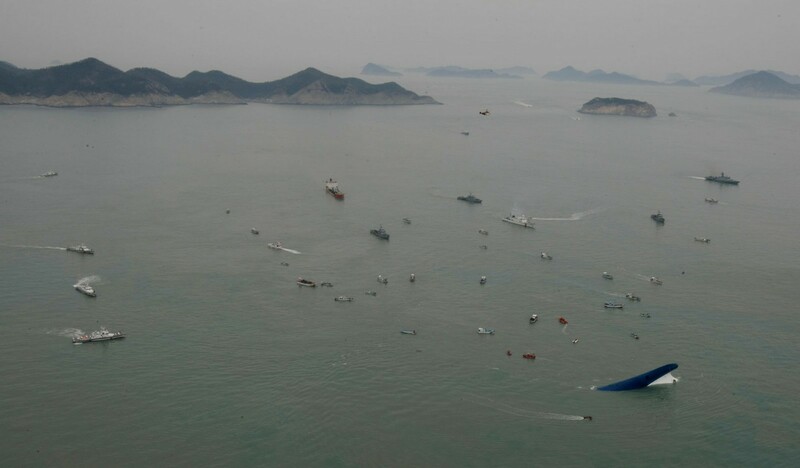 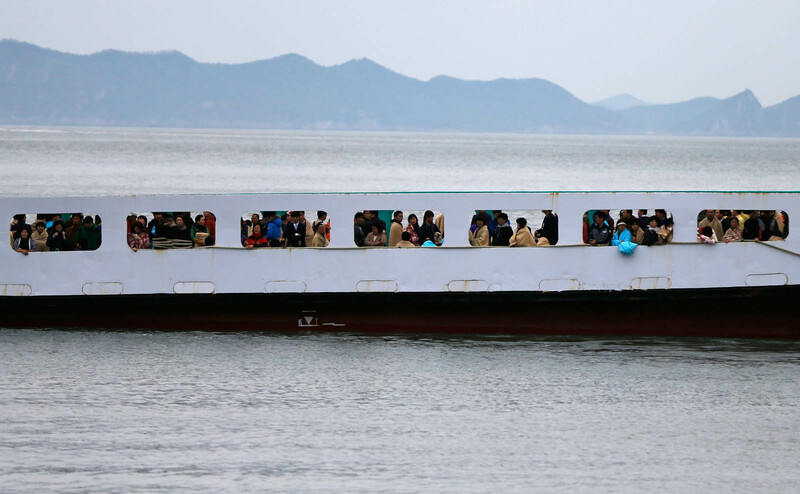 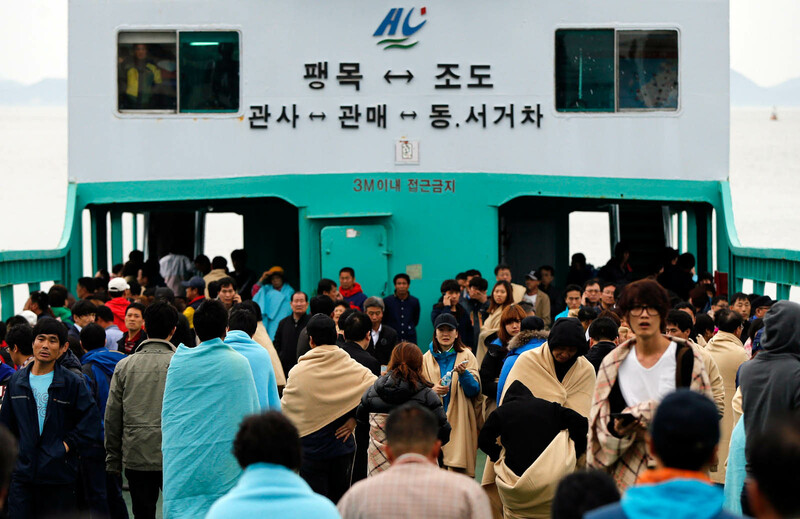 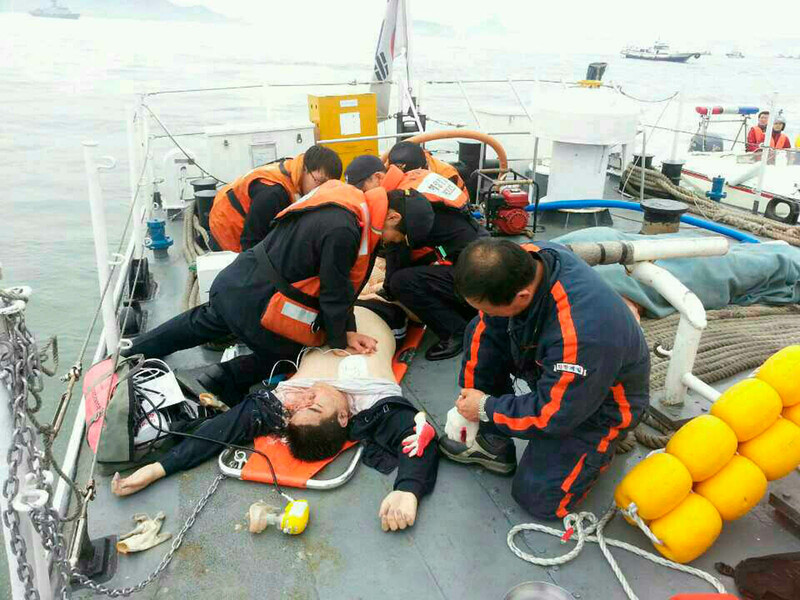 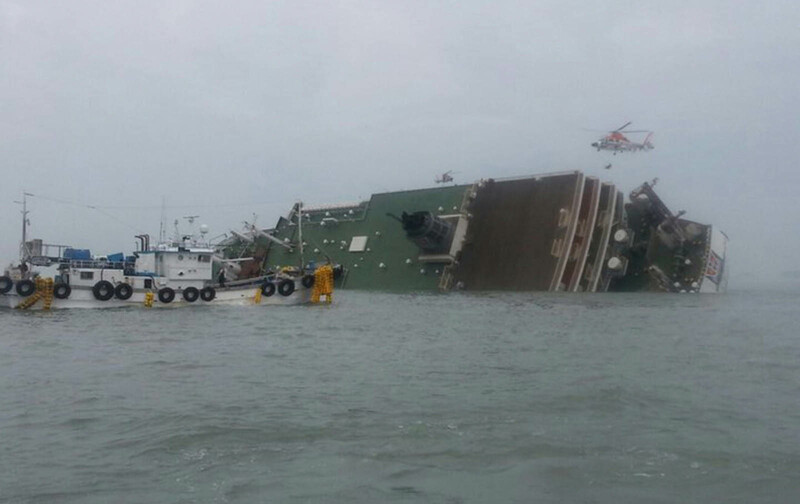 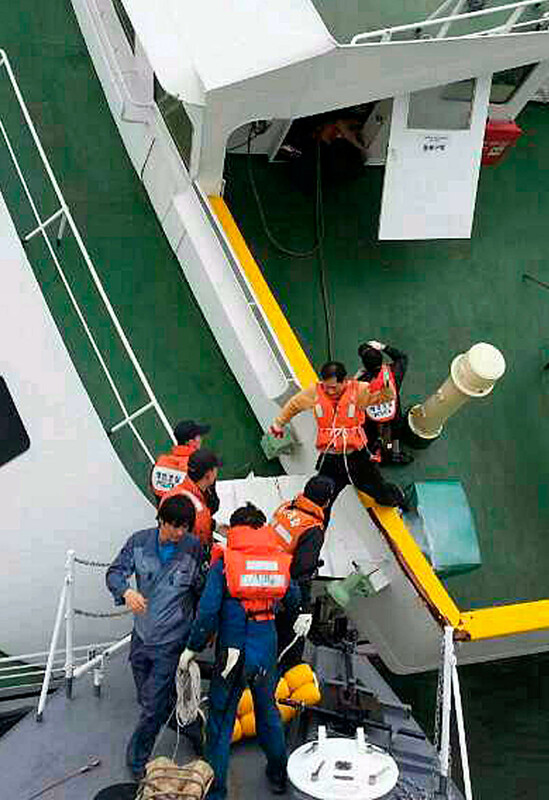 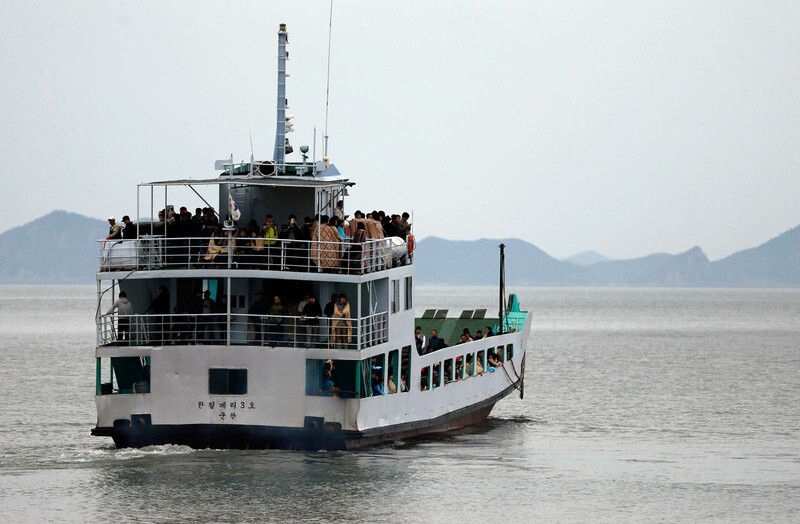 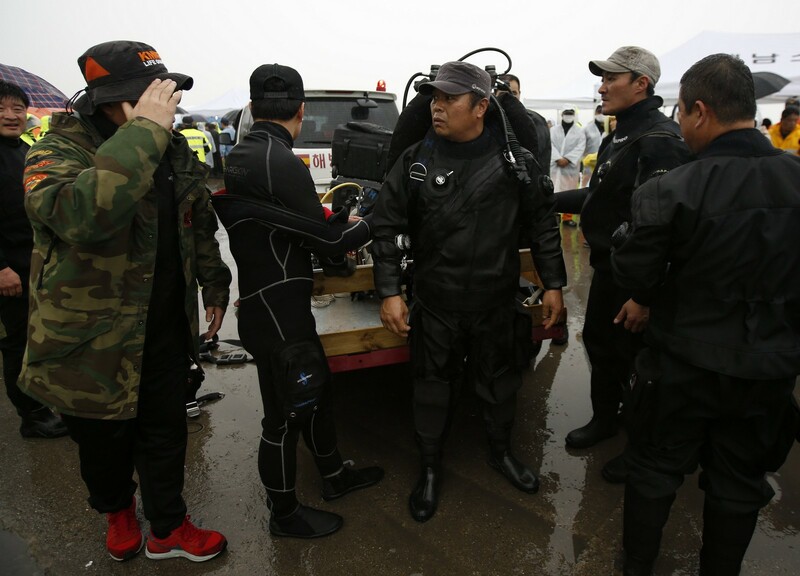 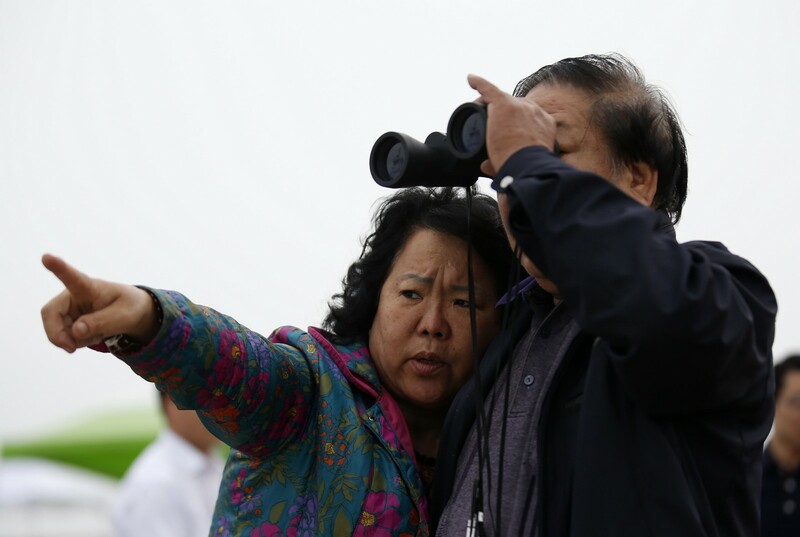 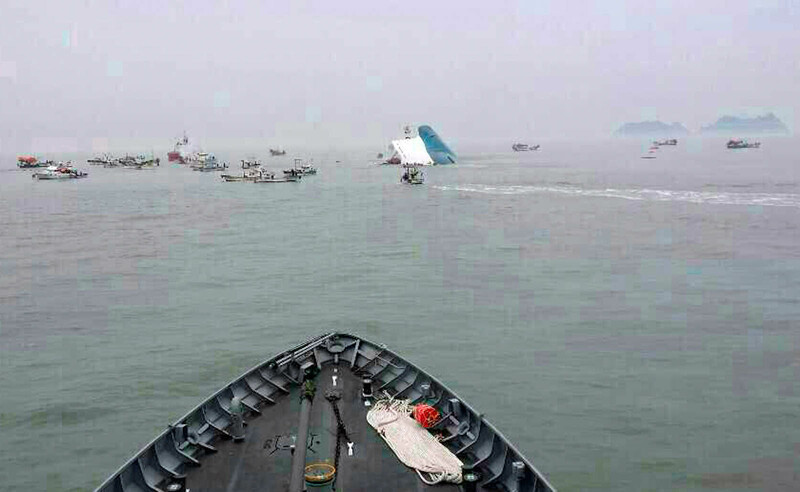 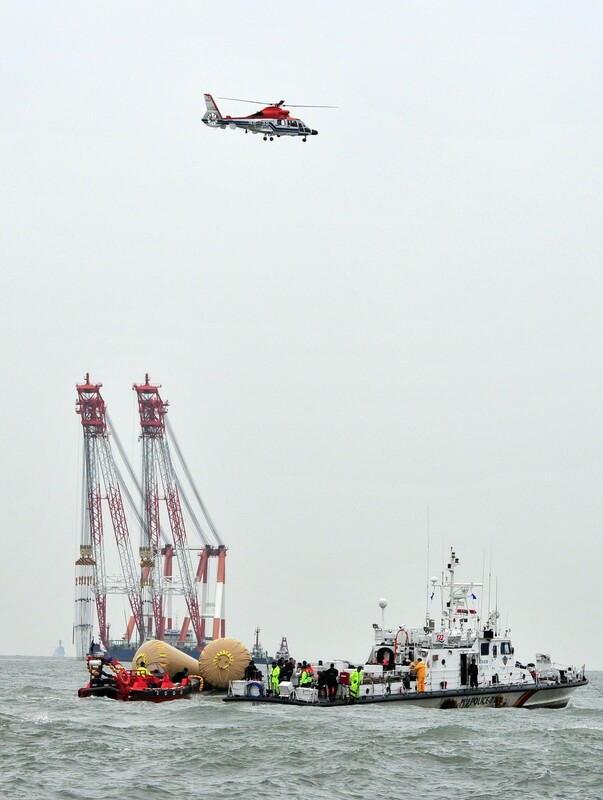 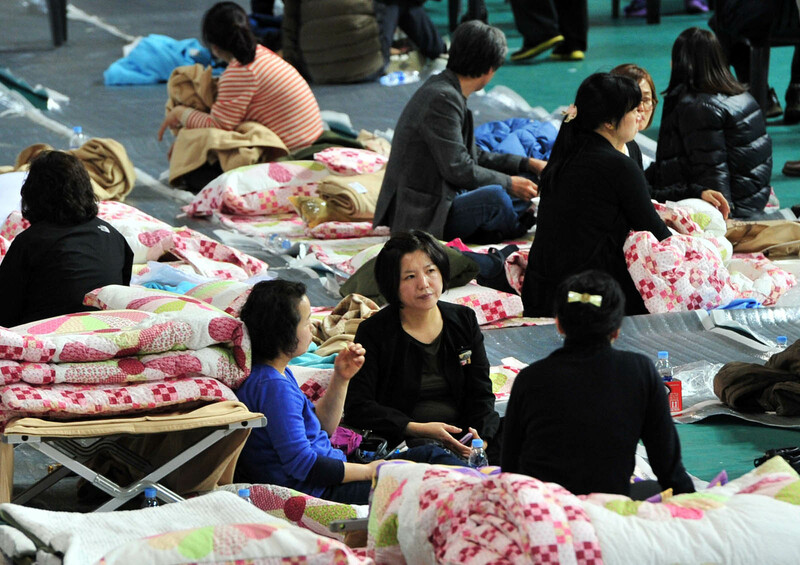 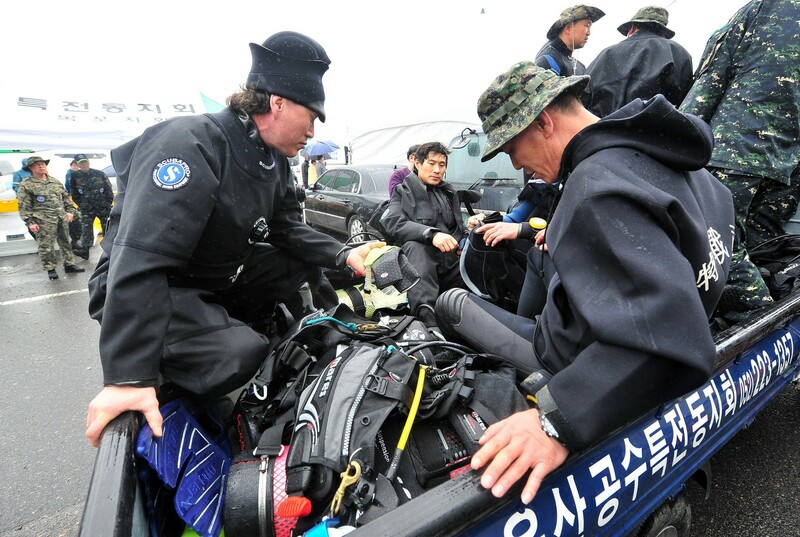 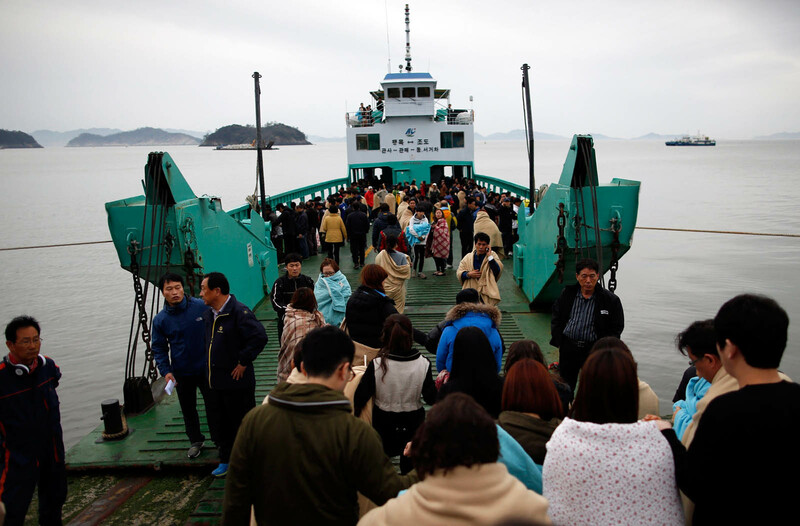 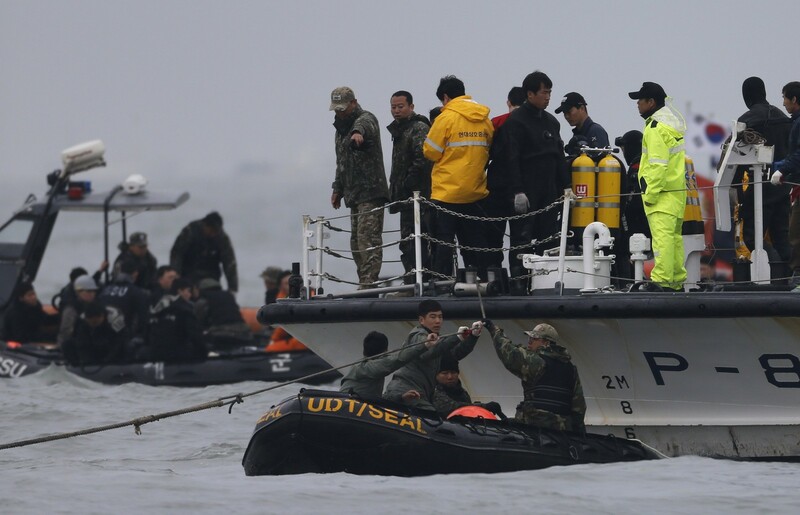 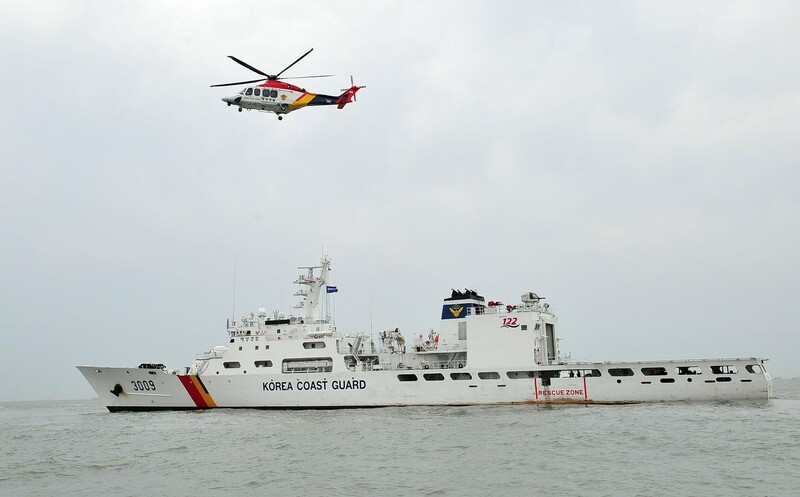 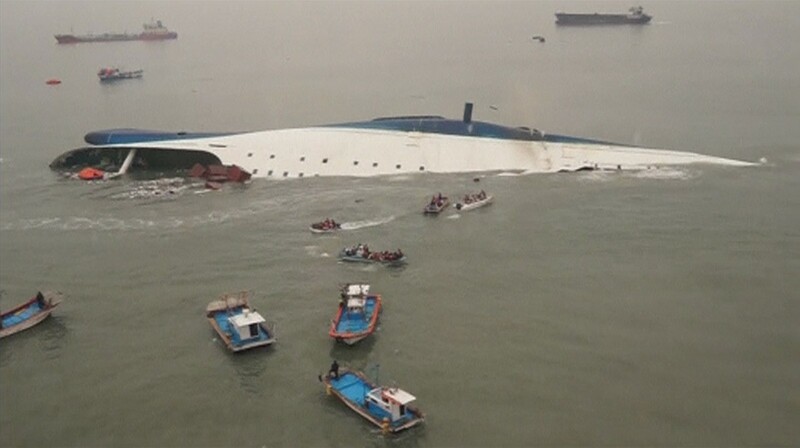 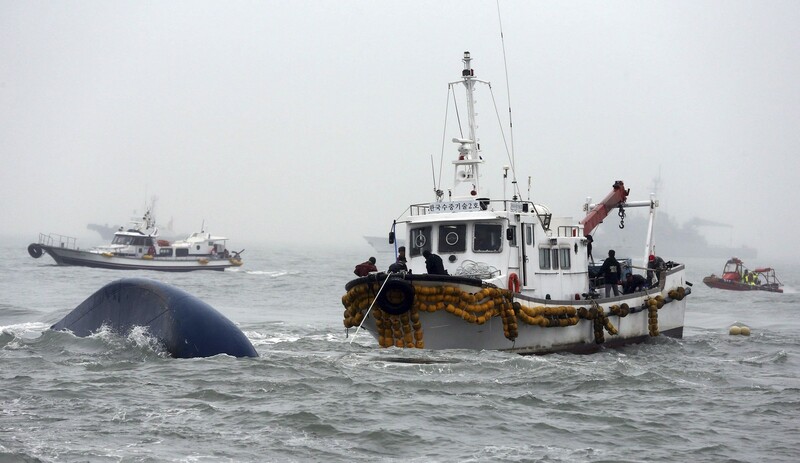 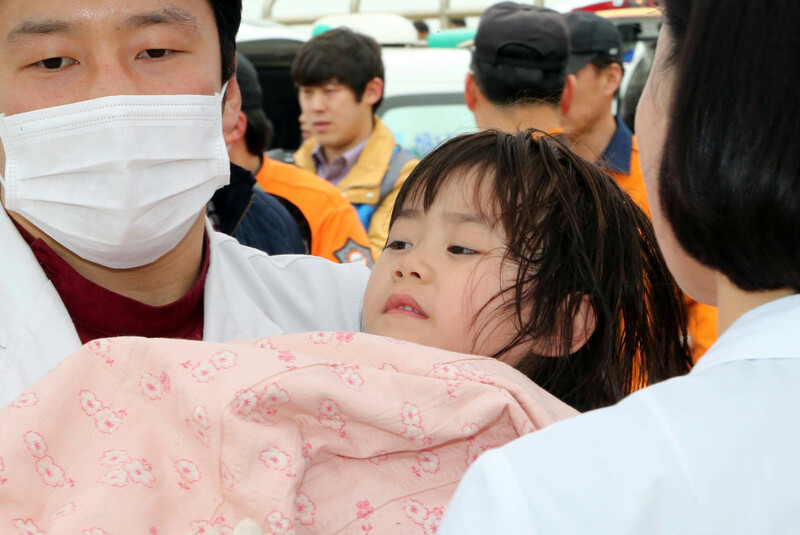 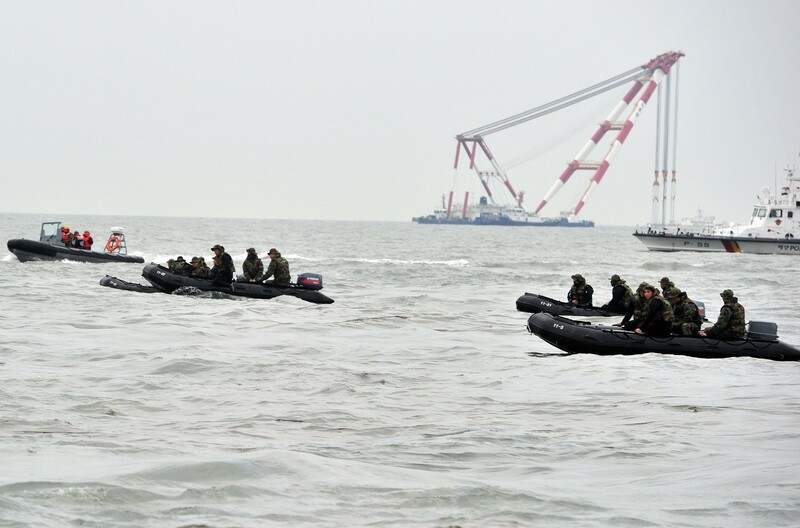 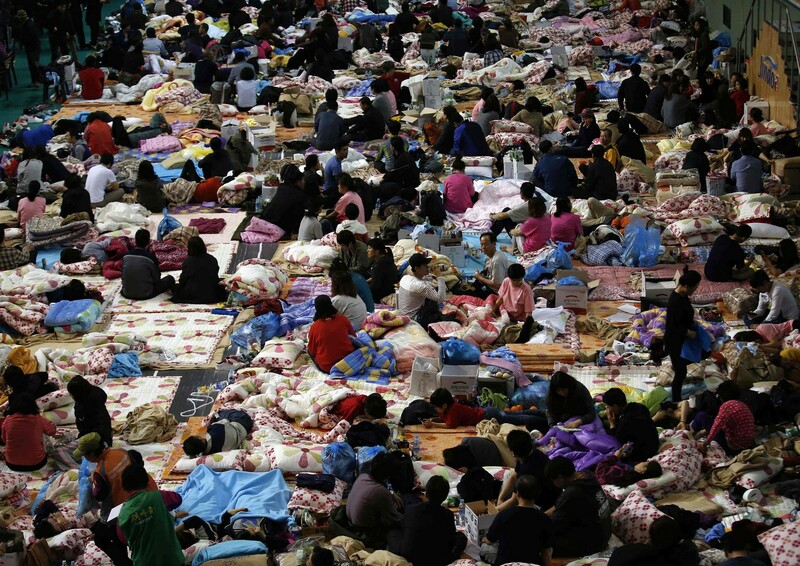 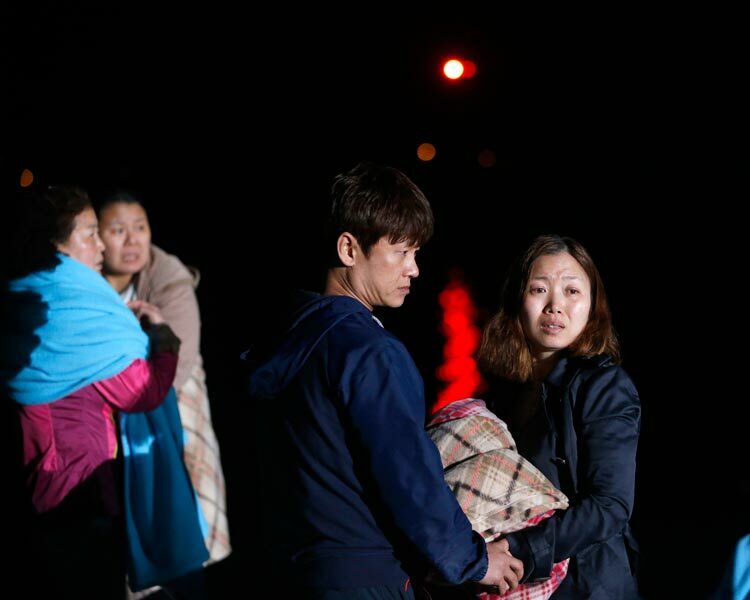 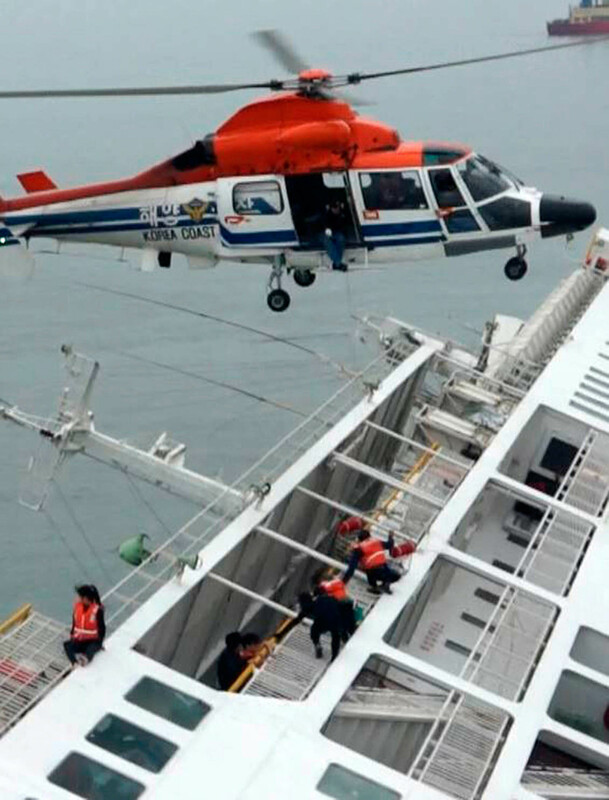 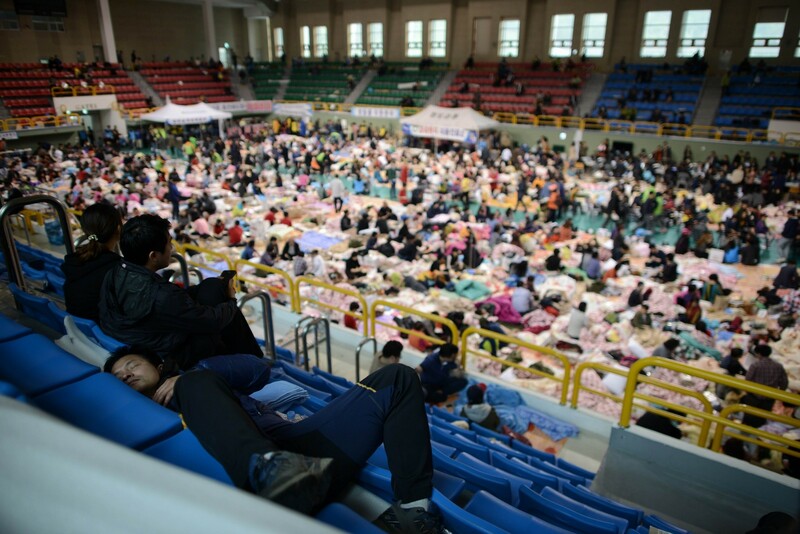 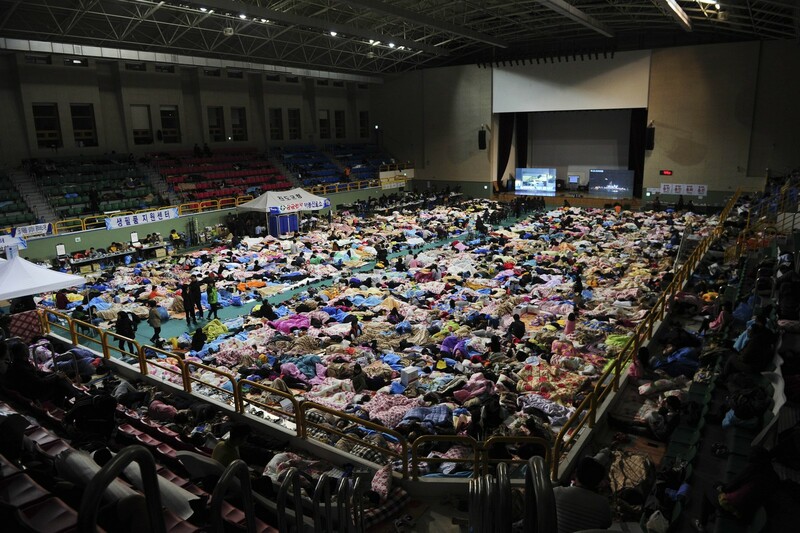 According to several accounts, the evacuation order was broadcast at about 10.15 am The captain and most of the other crew members are thought to have been rescued at about 9.38 am, soon after communications between the Sewol and the Jindo Vessel Traffic Service ended. 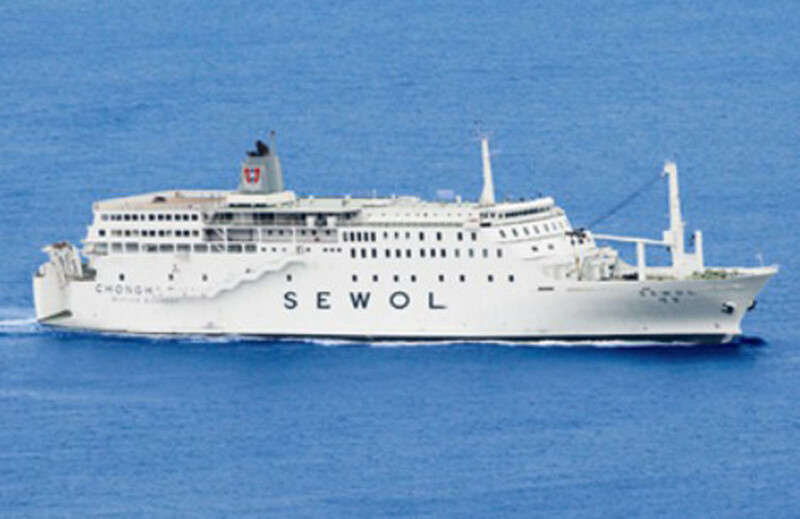 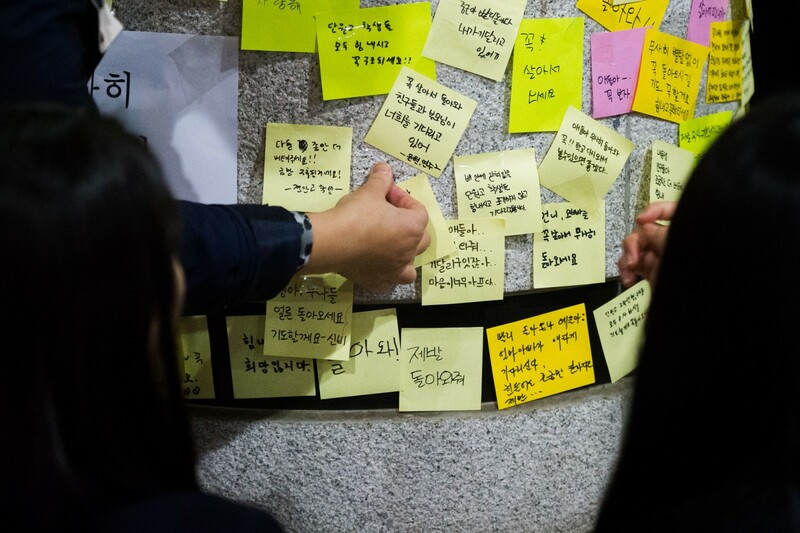 In addition, it has emerged that the Sewol is likely to have set sail despite its operator Cheonghaejin Marine Co. and some crew members being aware of faults in the ship's steering system. 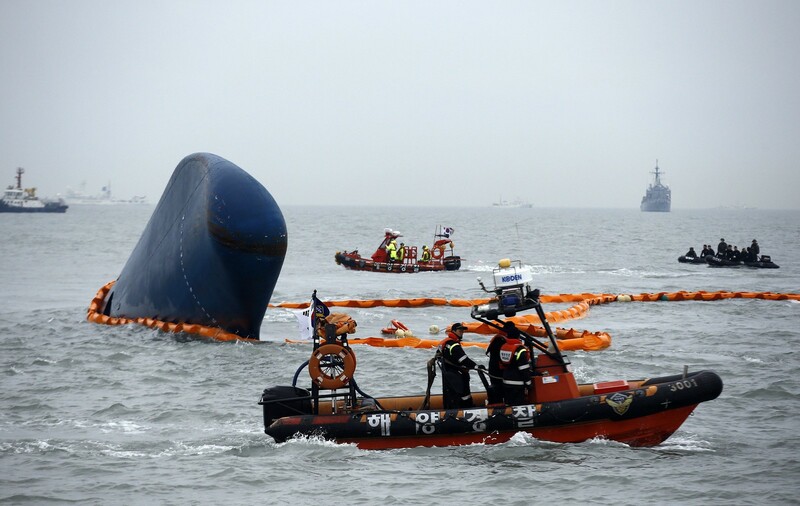 Documents secured by a local news network showed that the ship's captain made a request for the steering gear to be repaired on April 1. 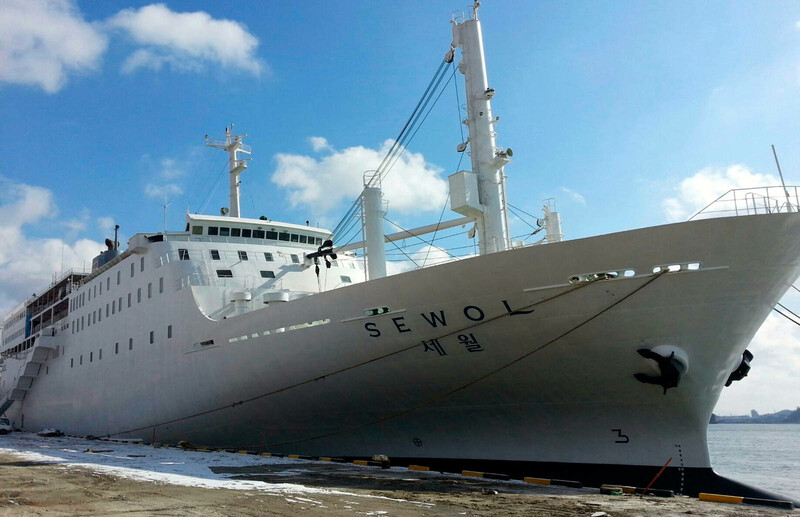 However, Cheonghaejin Marine Co.'s maintenance service provider told the network that it had not carried out any repair work, nor was it under contract to do so. 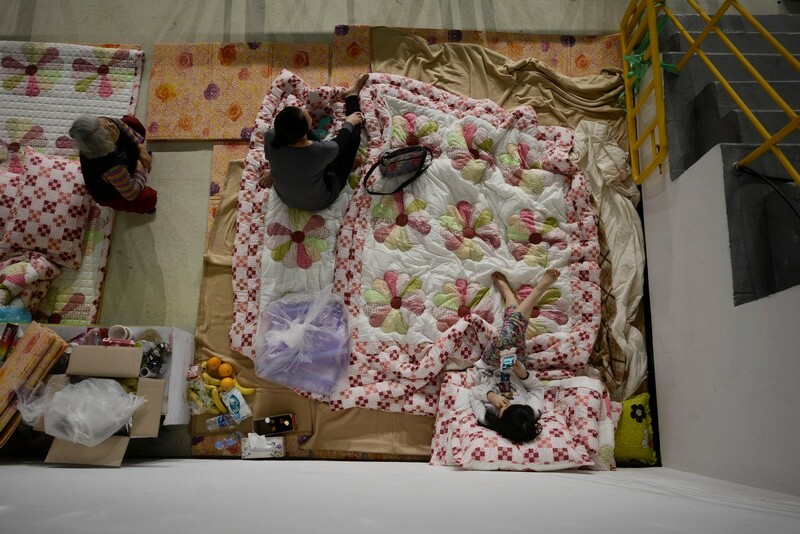 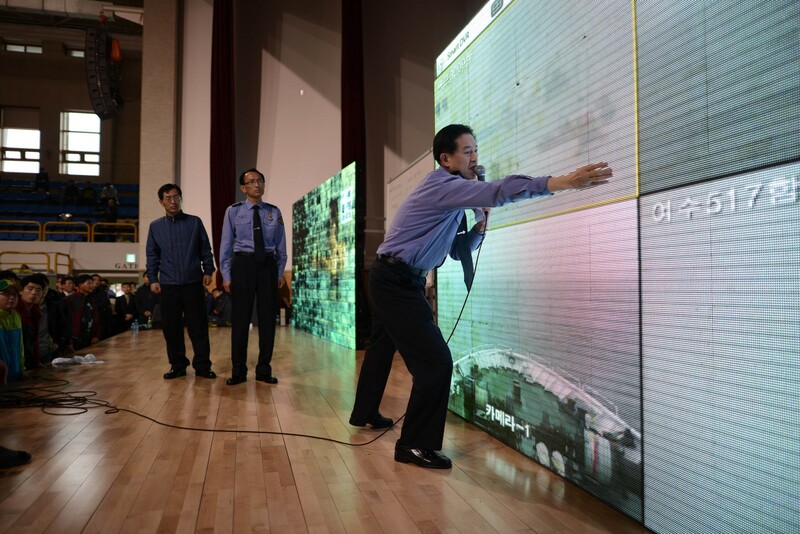 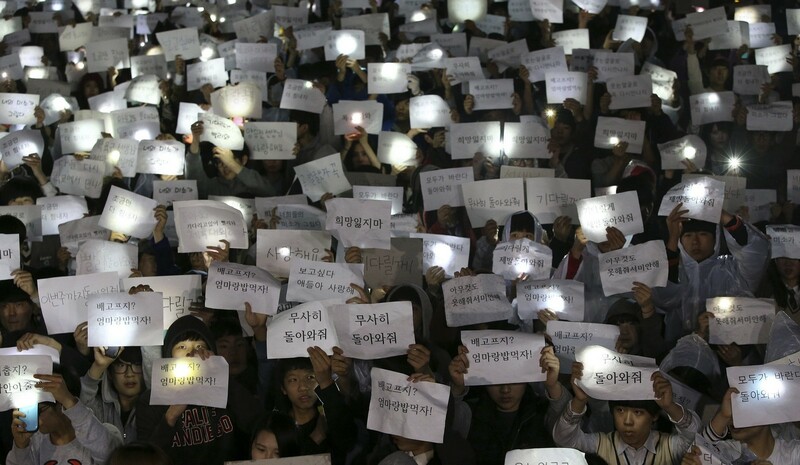 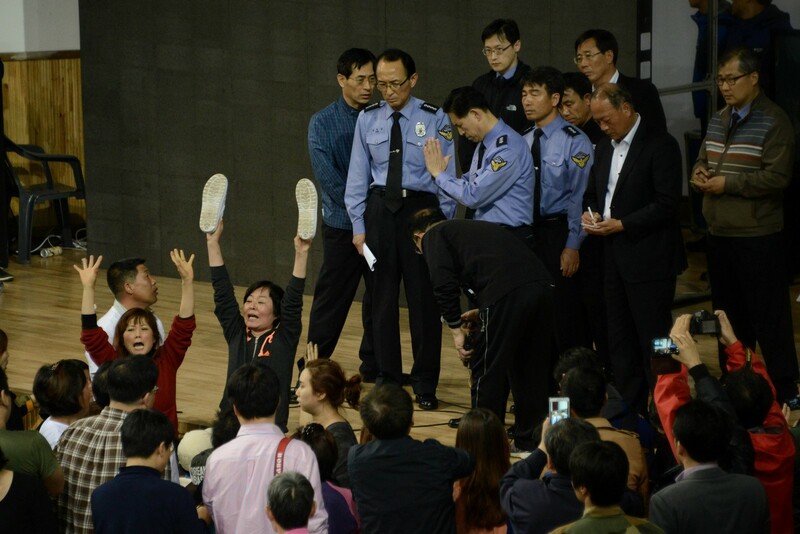 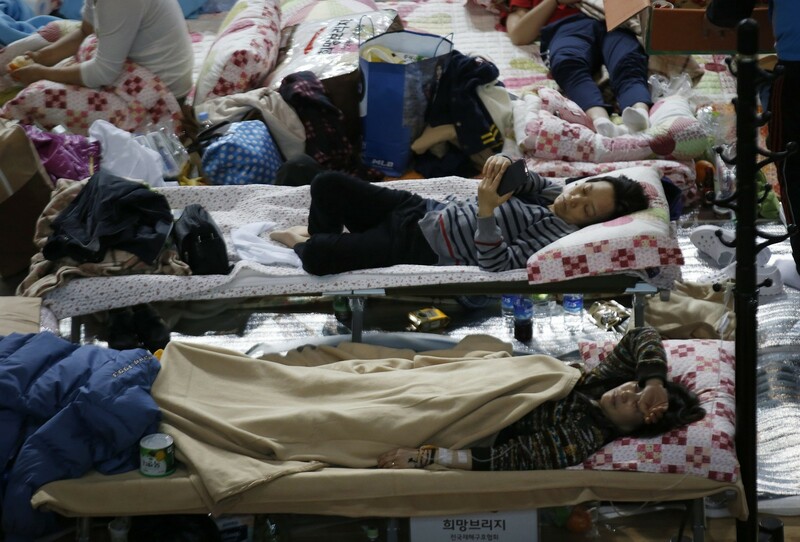 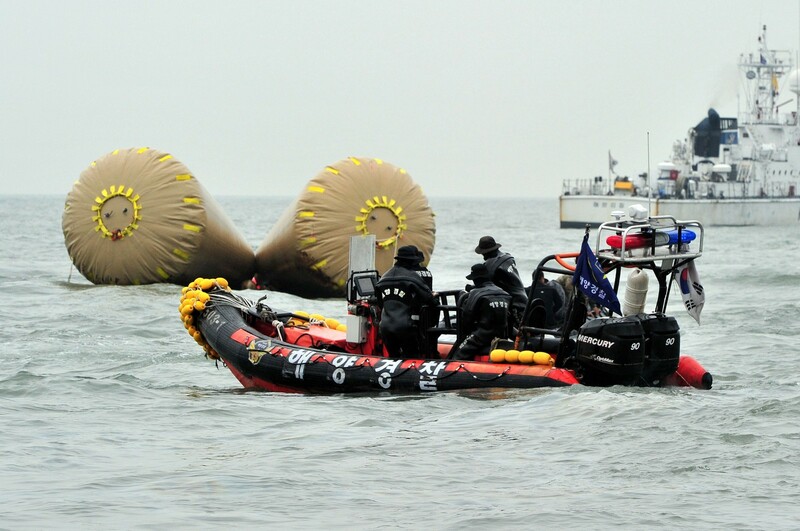 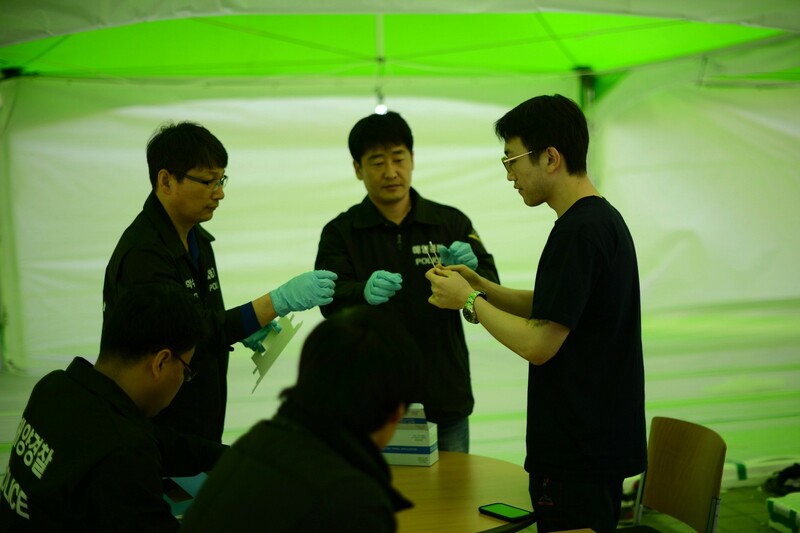 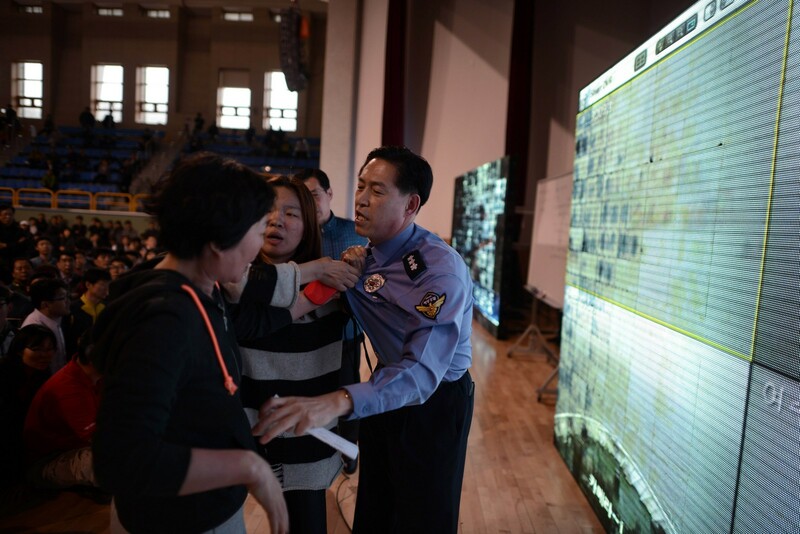 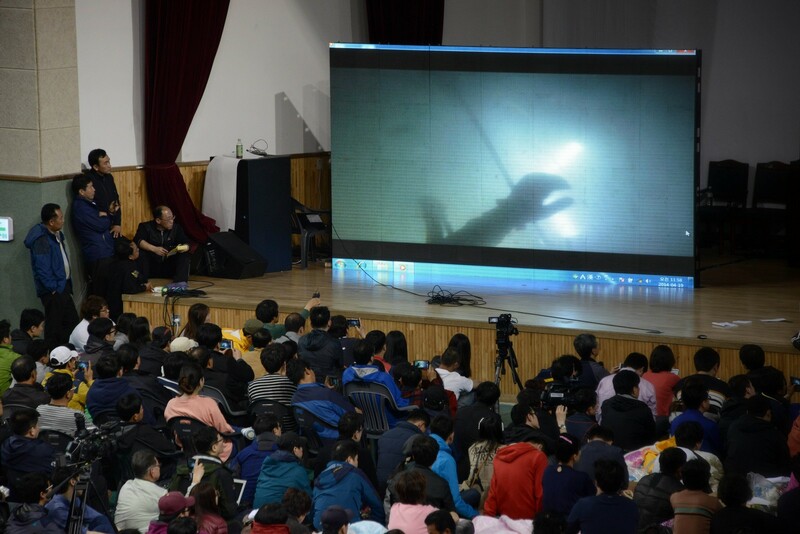 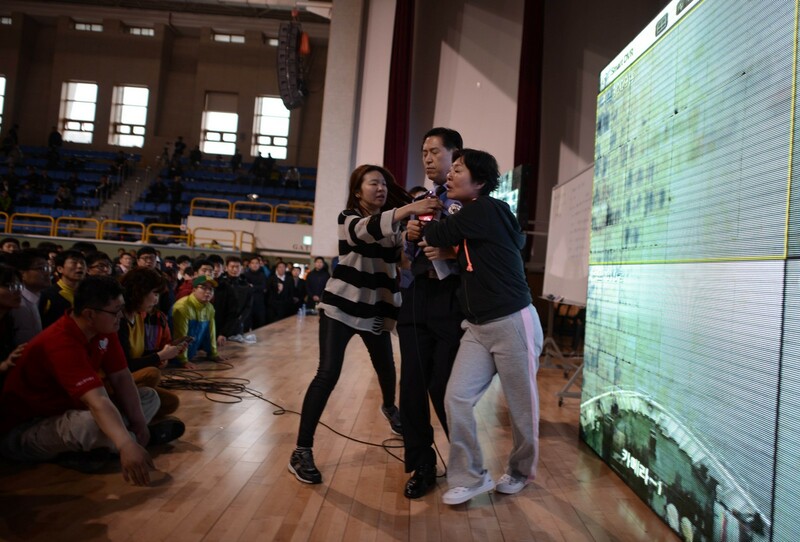 Having found evidence of structural defects in the Sewol, the probe has expanded to engulf the Korean Resister of Shipping, which tested the ship for its ability to regain balance. 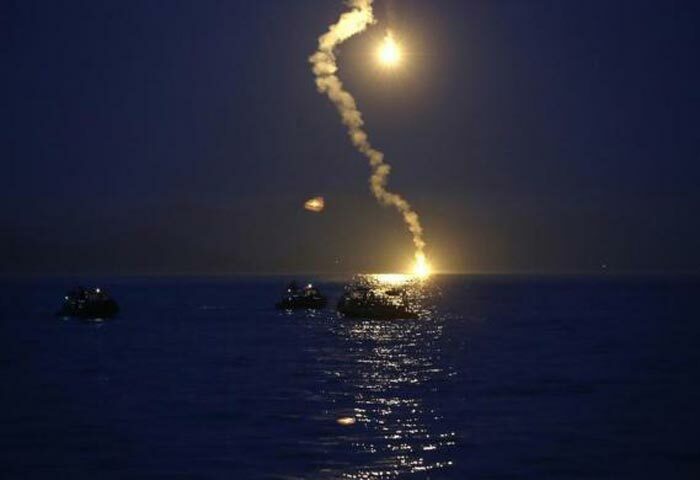 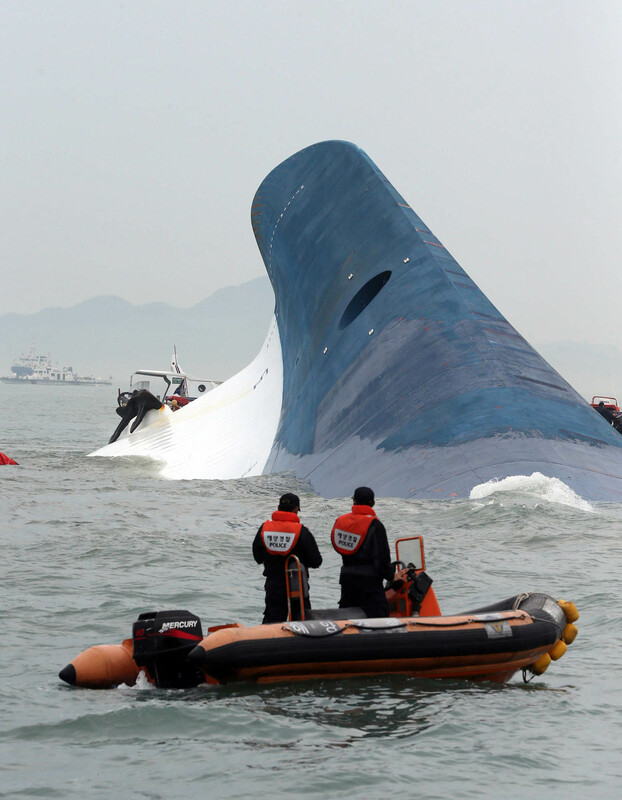 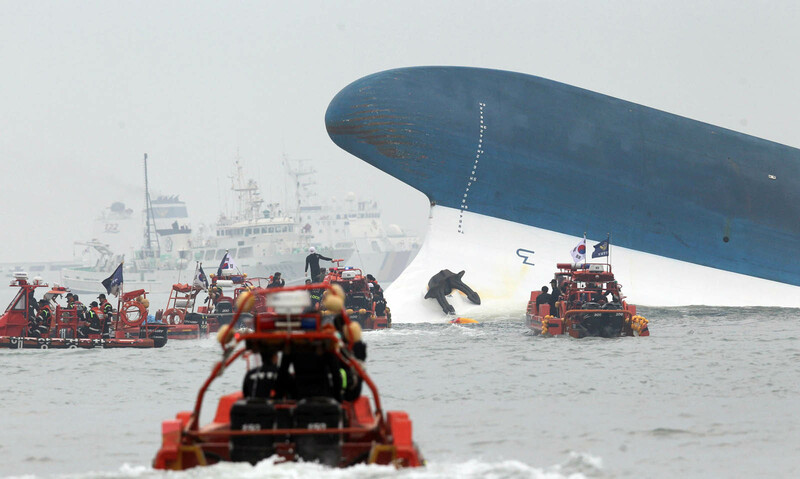 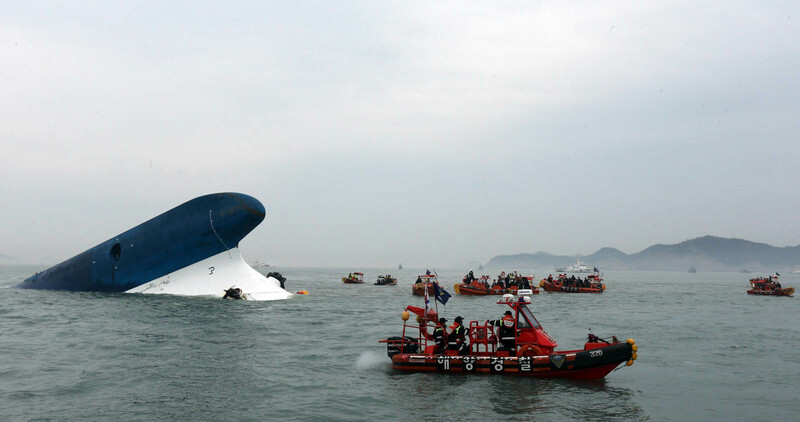 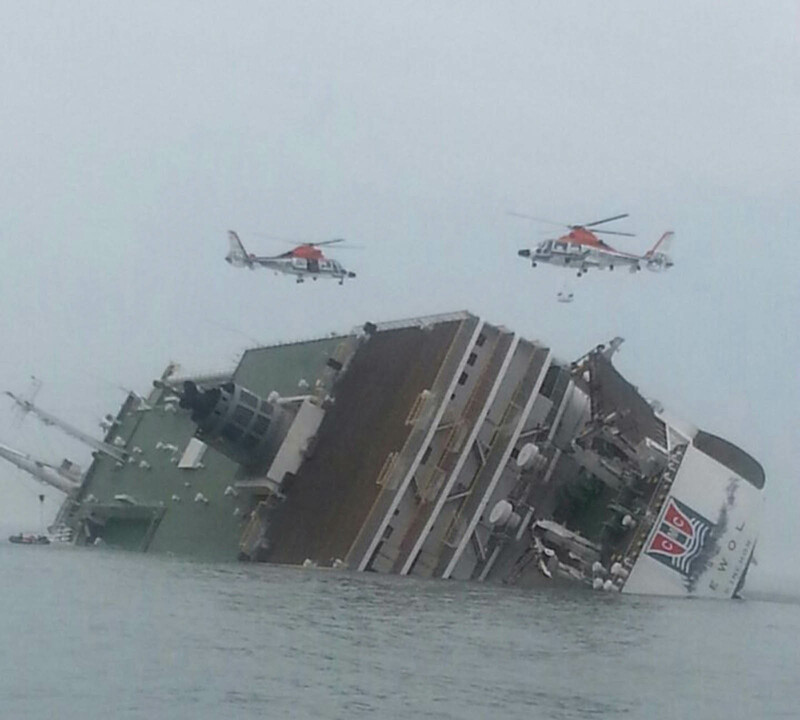 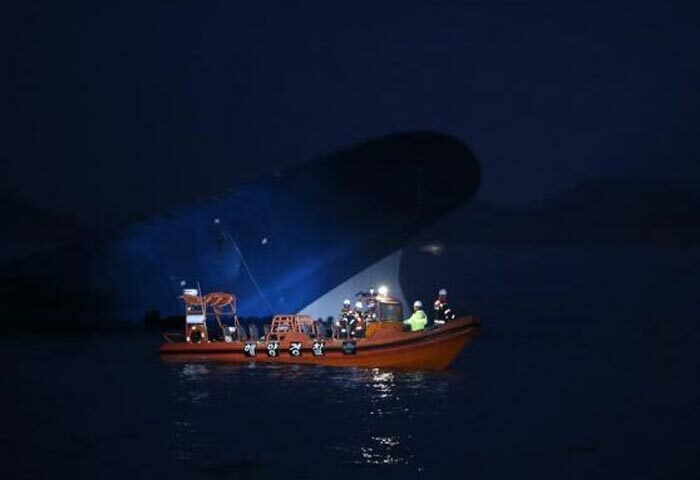 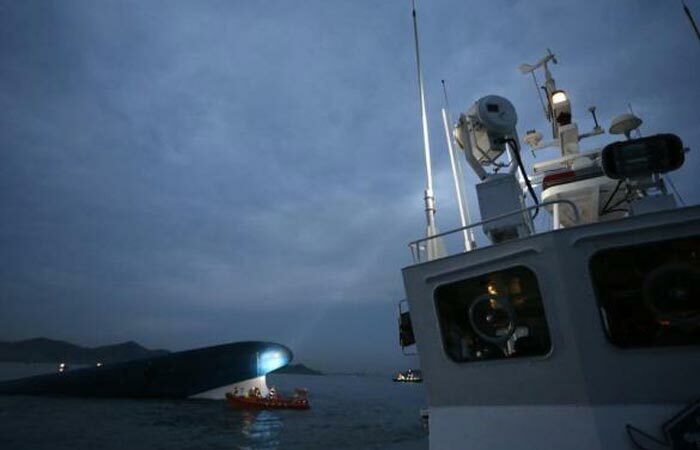 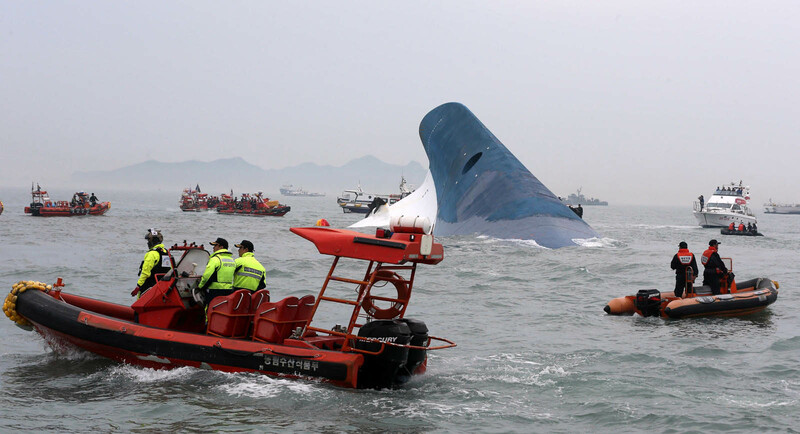 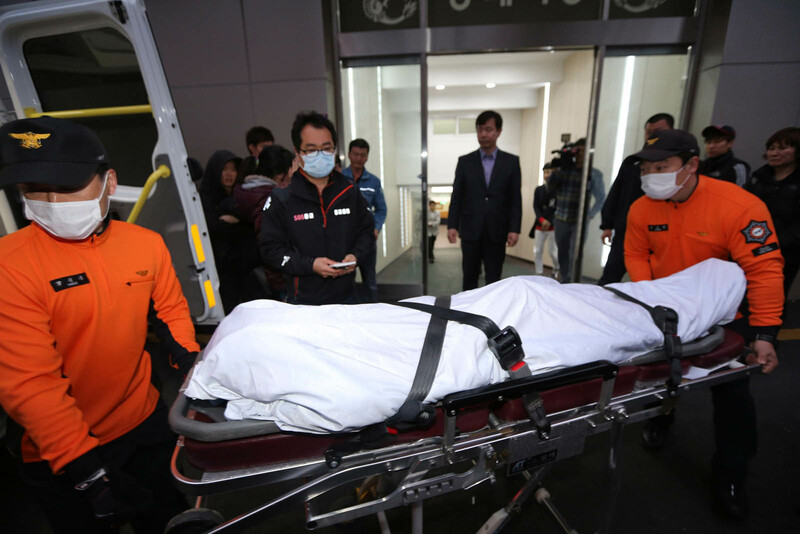 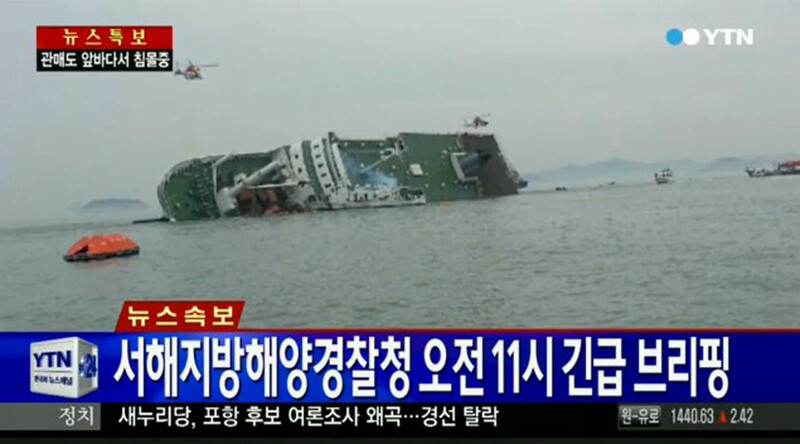 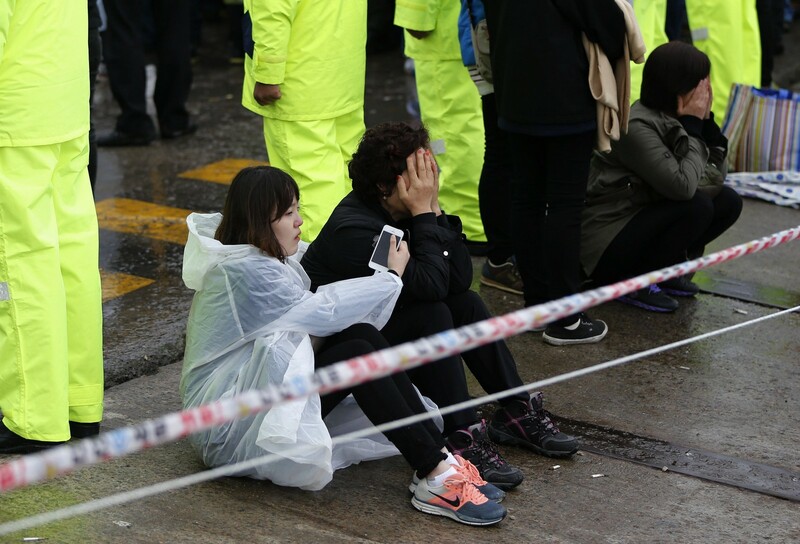 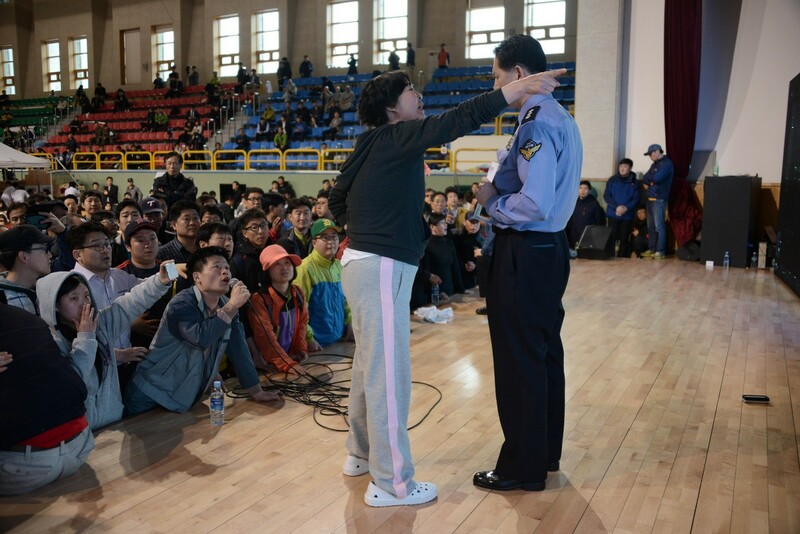 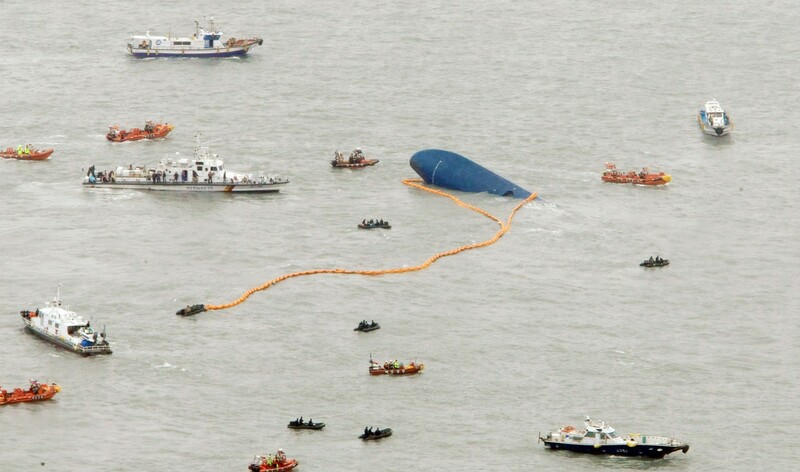 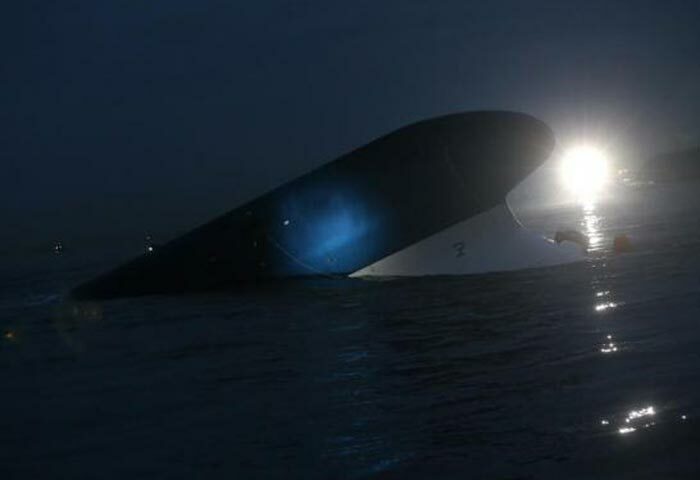 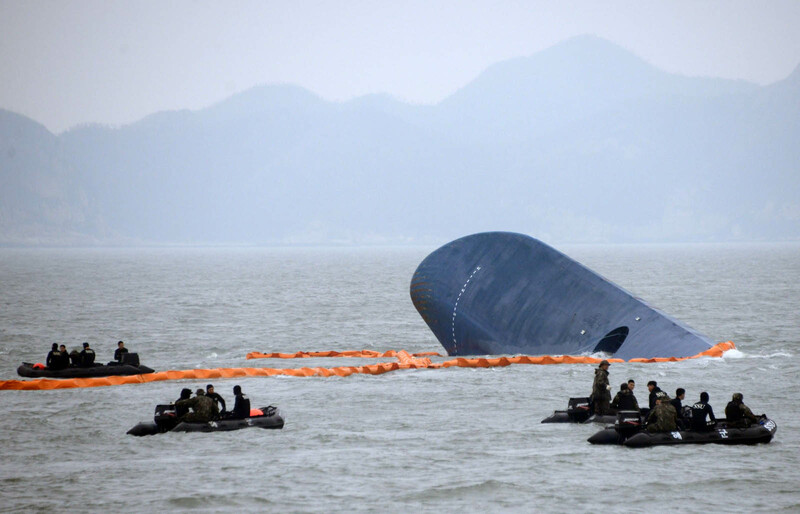 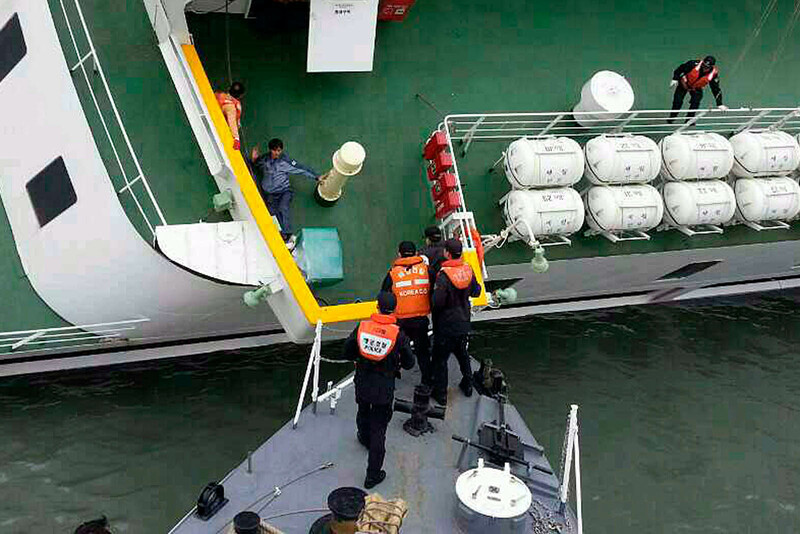 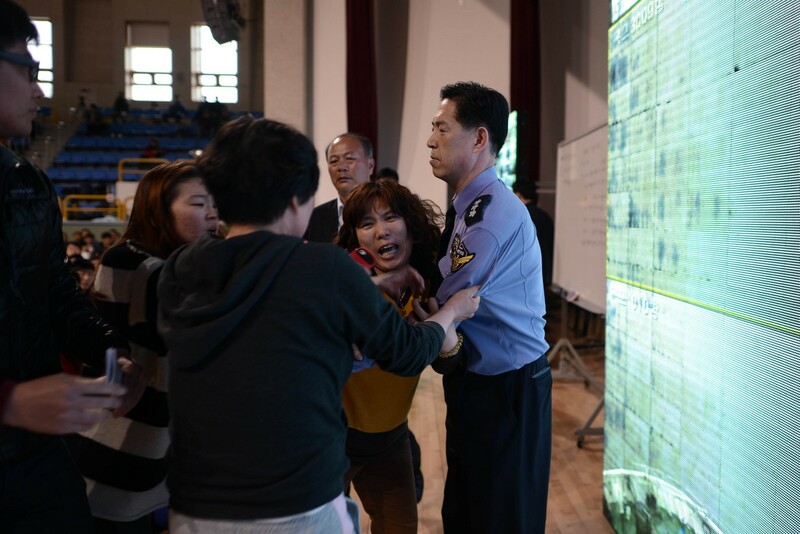 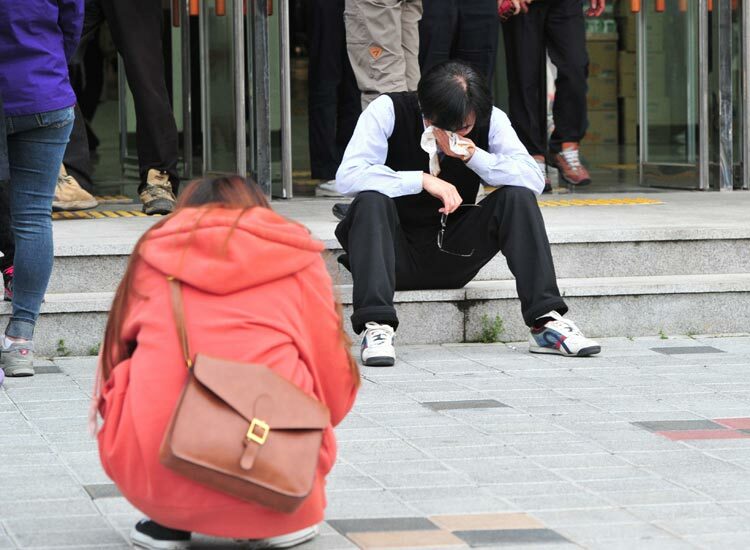 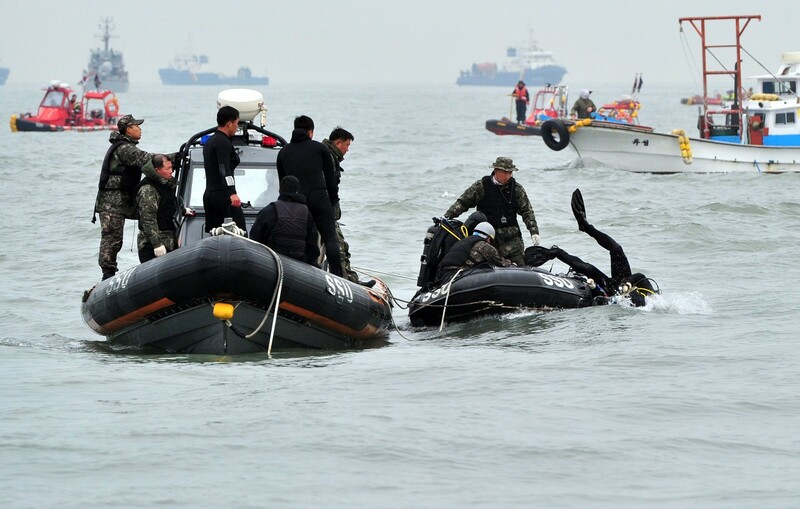 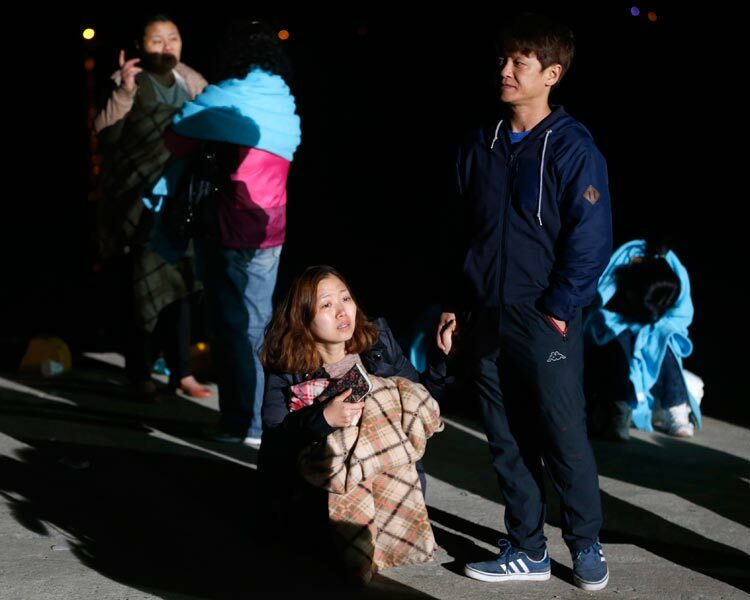 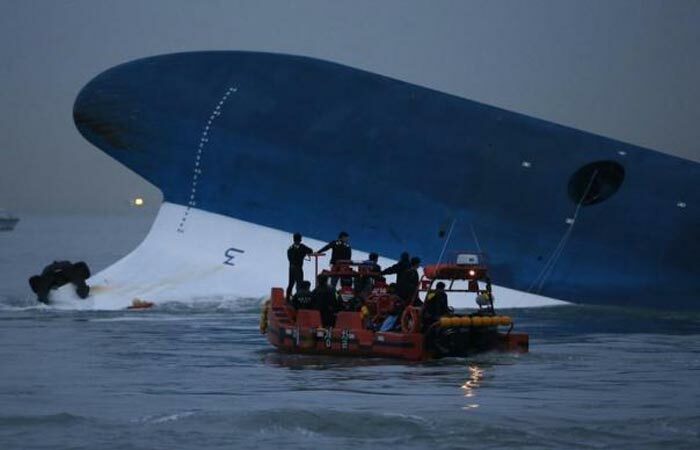 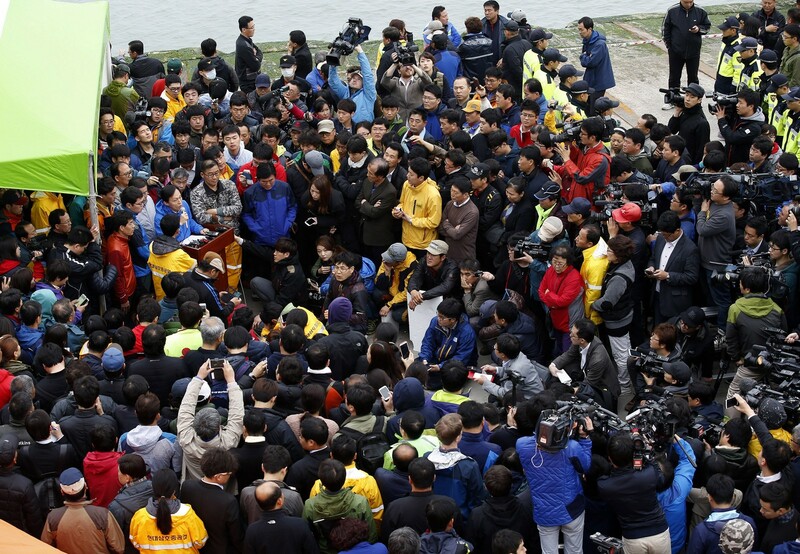 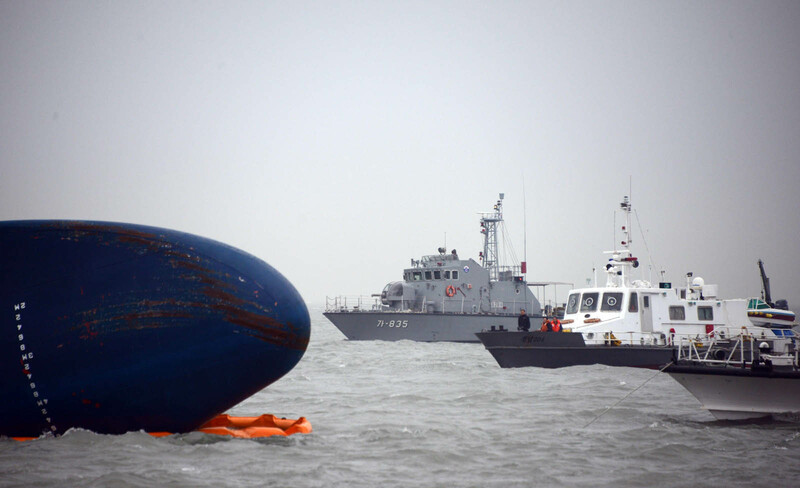 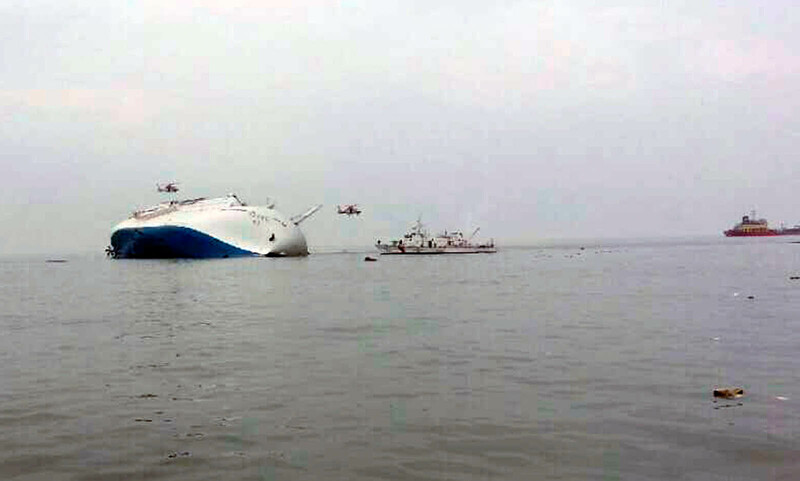 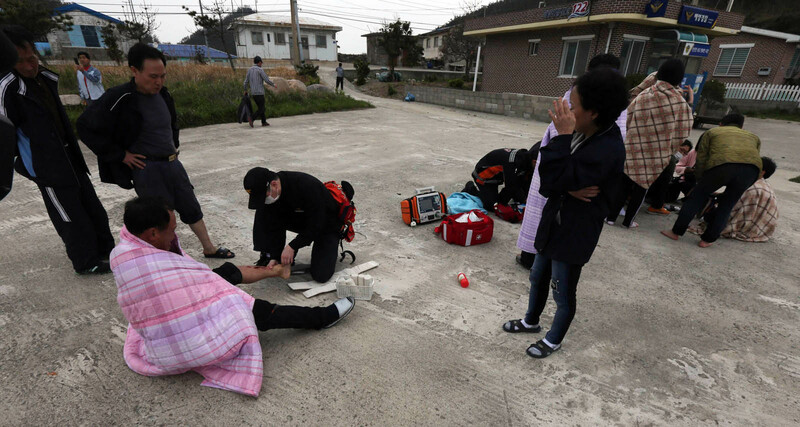 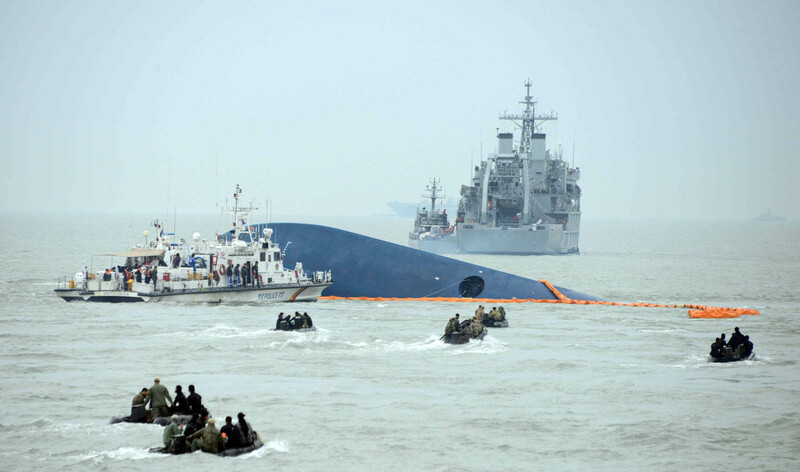 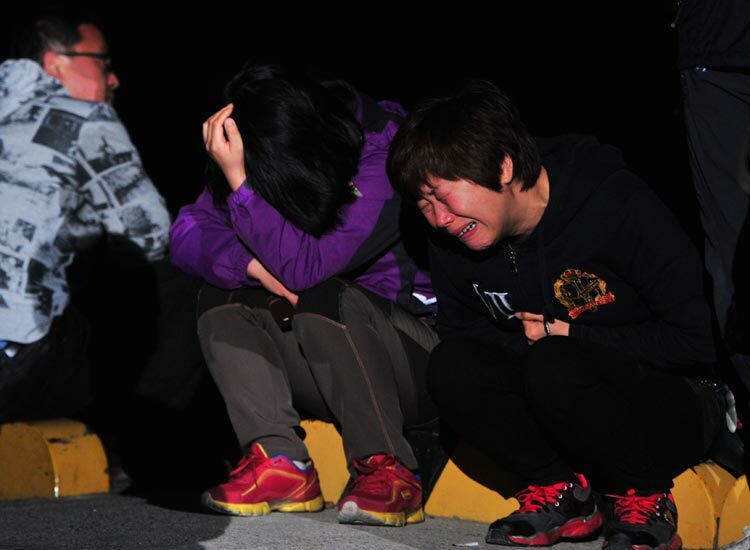 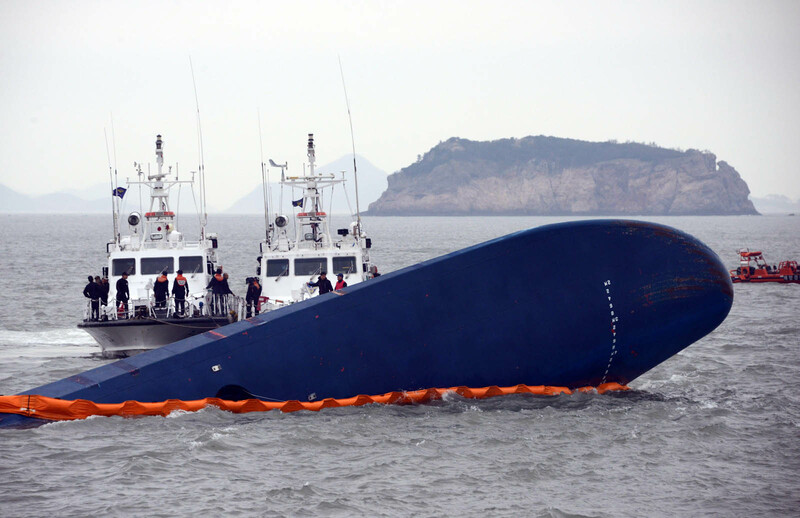 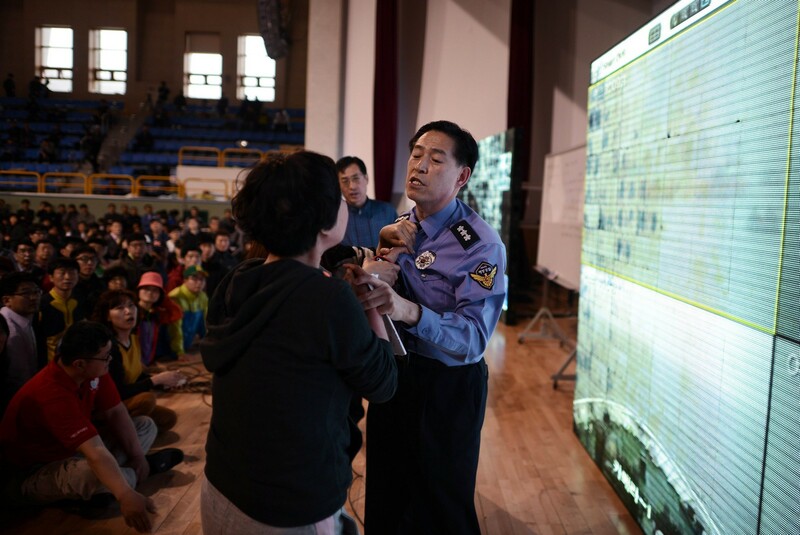 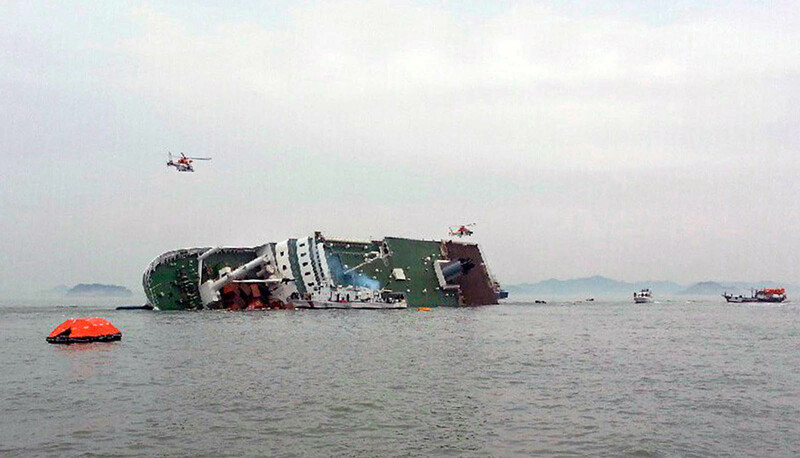 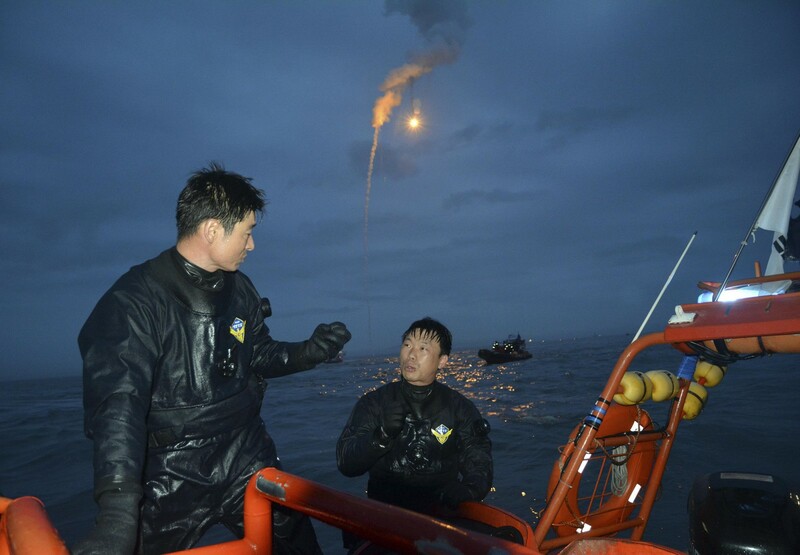 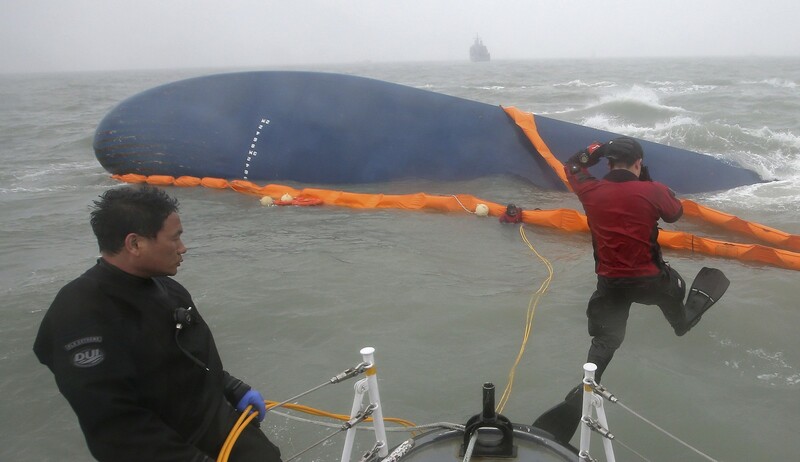 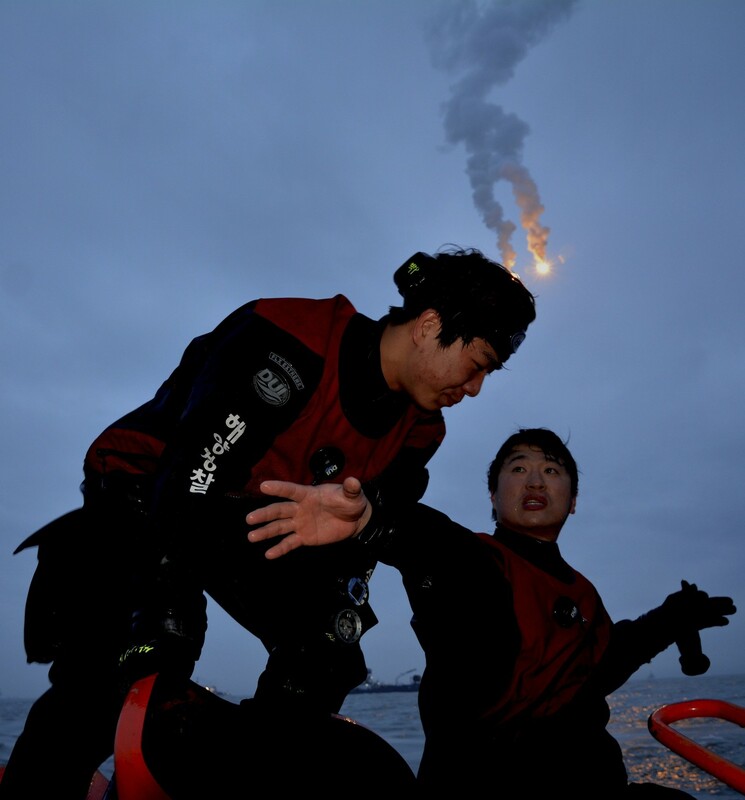 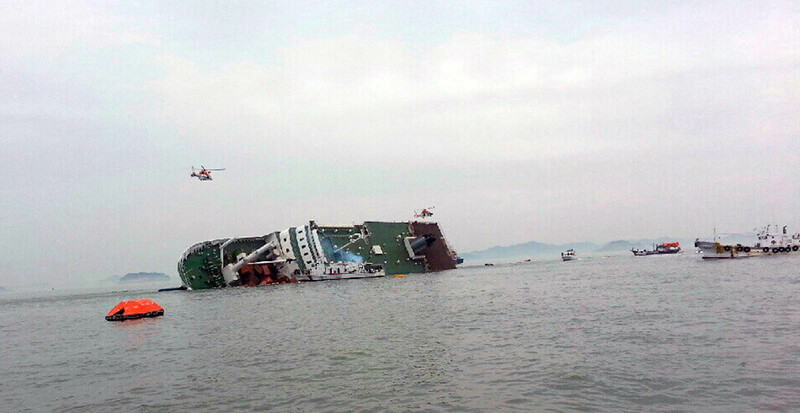 Korea's worst maritime accident in more than two decades has also led to a widening investigation involving those who spread rumours about the accident. 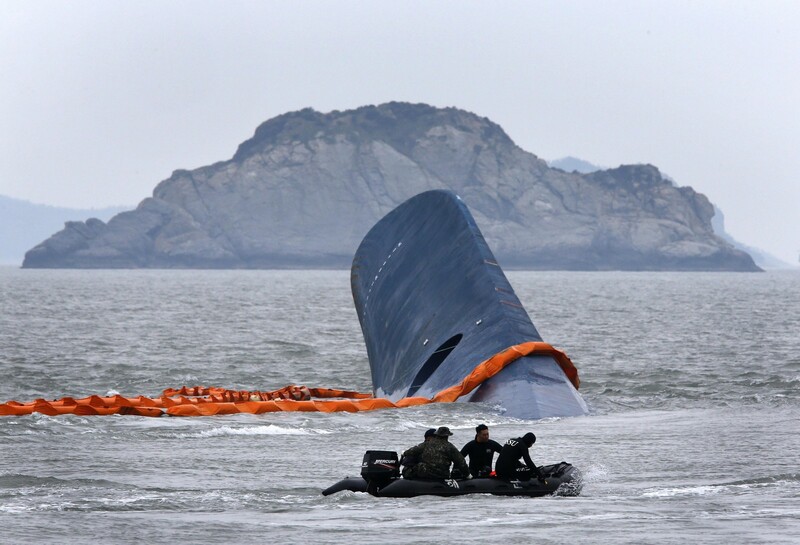 Since the ship sank, a number of online posts, ranging from people claiming to be trapped inside the wreckage to those claiming that a collision with a Navy submarine caused the accident, have circulated. 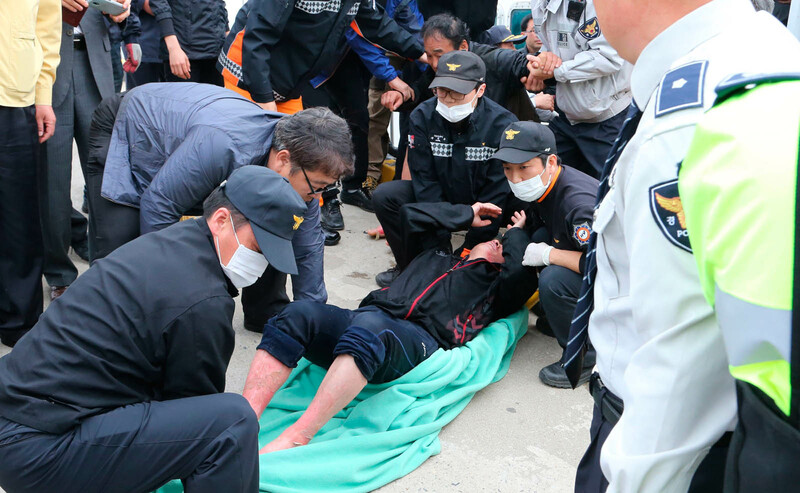 The police have been clamping down on these related issues and on Wednesday 15 suspects were question in connection to false reports. 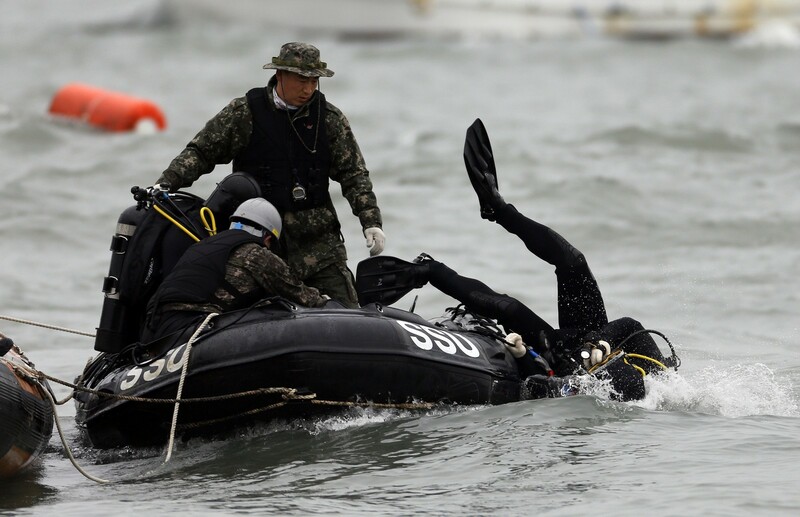 In addition, the 26-year old woman who claimed that the Coast Guard told civilian divers to "kill time" was arrested on charges of defamation.